Scores of audio producers in the Podcast Production space have adopted an inaccurate term when referring to basic Loudness Normalization: Loudness Leveling. Audio is measured in it’s entirety. The existing Integrated (Program) Loudness is determined. A gain offset is applied relative to a spec. based or subjective Integrated Loudness target. For example: if the source audio measures -20 LUFS, and the Loudness Target is -16 LUFS, +4 LU of gain will be applied. As well, a True Peak Max. Ceiling is defined, which again may be spec. based or subjective. If the required Integrated Loudness gain offset results in overshoots – limiting is applied in order to maintain compliance. It’s important to note that Loudness Normalization does not correct wide variations in audio levels. As well – it does not guarantee optimized intelligibility for spoken word. If an audio piece (e.g. multiple participant segment) contains inconsistencies as such, the Loudness Normalization gain offset will simply elevate (or reduce) the relative perceptual loudness of the audio. The original dynamic attributes will persist. That’s it. There’s nothing more to it unless the Loudness Normalization tool features some sort of dynamics optimization process that may or may not be active. 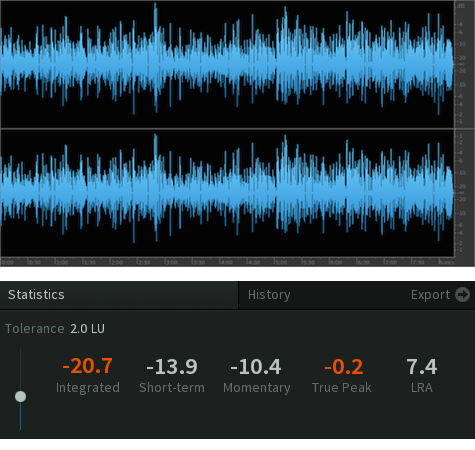 For the record – the Loudness Module included in iZotope’s RX 7 Advanced Audio Editor applies basic Loudness Normalization (measurement, gain, and limiting). It does not apply optimization processing. Leveling is a process that addresses and corrects noted inconsistencies and level variations. It is accomplished by the use of gain riding plugins and/or specialty tools that rely on complex algorithms. One basic example is the use of an “RMS” Compressor featuring an optimal and often extended release time parameter. This is a “leveled” version of the original source clip displayed above. The previously persistent level inconsistencies no longer exist. 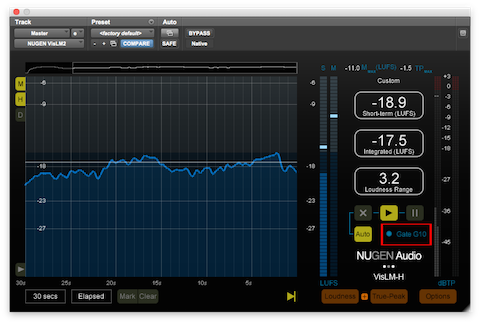 Finally, this is the leveled audio, Loudness Normalized to -19.0 LUFS. The described processes were in fact discrete. I hope I’ve made it clear that the term Loudness Leveling is not an accurate term to describe Loudness Normalization. The key is that Loudness Normalization is gain and limiting. It does not correct inconsistent level variations. You’ll need to implement discrete Leveling processes to address persistent inconsistencies. An obscure and rarely mentioned audio plugin by Waves exists that is well suited for Spoken Word processing, Live Streaming, and Podcast Post Production – MaxxVolume. Back in 2012 I documented my initial interest and subsequent purchase of MaxxVolume. I paid $149 for the plugin, on sale at the time over at DontCrack. I believe the original selling price was $400. It’s currently available for $49. MaxxVolume is a multi-stage dynamics processor. The plugin features High/Low Level Compressor modules, a Downward Expander, a Leveler stage (aka RMS compressor/AGC), a user selectable Loud/Soft ARC flag, and a global Output Gain control. The Leveler fader value defines the AGC threshold and target. The inherent processing uses long attack and release times similar in attributes to an RMS compressor to effectively maintain consistent levels over time. Basically, automatic gain-riding initializes when the passing signal level exceeds the threshold and correlated target. The Energy Meter’s internal chain placement is located after the Leveler processing and before the plugin’s remaining dynamics modules. The included Gate is essentially a Downward Expander. When the passing signal level drops below the defined Threshold fader setting – attenuation is initialized. Note the general difference between a Gate and Downward Expander: a Gate applies a sort of hard mute. A Downward Expander applies a much more gentile transition between audibility and attenuation. A traditional compressor applies gain reduction (dynamic range compression) when signal levels exceeds a defined threshold. In general the operator may (1) elect to work with the compressed/attenuated audio, or (2) apply makeup gain to compensate for the resulting attenuation. The MaxxVolume High Level Compressor is controlled by a single Threshold fader. Gain reduction is indicated on the associated meter when the signal level exceeds the defined threshold. Automatic makeup gain is applied to compensate for active gain attenuation. The Gain fader located in this module controls the maximum output signal level. This setting is NOT a ceiling based compliance limiter! This module basically applies upward soft-knee compression. It allows the operator to add a specific amount of gain to the passing audio when it’s level drops below the user defined threshold. The associated Gain Meter indicates the amount of makeup gain. Note: The High and Low Level Compressor threshold settings are displayed within the previously mentioned Energy Meter. This flag sets the attributes for the Waves proprietary ARC (Auto Release Control). 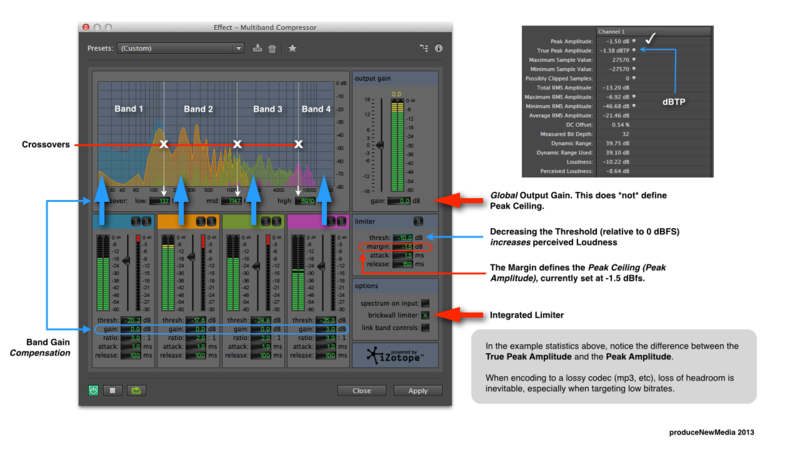 In essence – the Loud setting uses shorter Release times resulting in elevated loudness. Conversely the Soft setting uses longer Release times resulting in a softer output. This meter indicates Peak Amplitude and potential inherent clipping. (1) Disable the Downward Expander (you will use it eventually). By the way – all Threshold faders support deactivation. Simply click the encapsulated yellow indicator located on each fader. (2) Set the ARC flag to Soft and define a Leveler threshold. (3) Adjust the High Level Compressor to (1) compress dynamics, and (2) compensate for the attenuated signal level. (4) Apply 5 or 6dB of Low Level Compressor module gain. Tweak the module Threshold and readjust gain accordingly. Be cautious when applying excessive gain at levels above the defined threshold. Pay close attention to the noise floor. (5) Lastly, adjust the High Level Compressor Gain to optimize the output. If you are running Adobe Audition – use the Preview Editor to reflect the results of your settings relative to the source. The updated waveform will indicate the results of the applied settings. Observe the processed dynamics and evaluate the audible consistency of the average loudness over time. 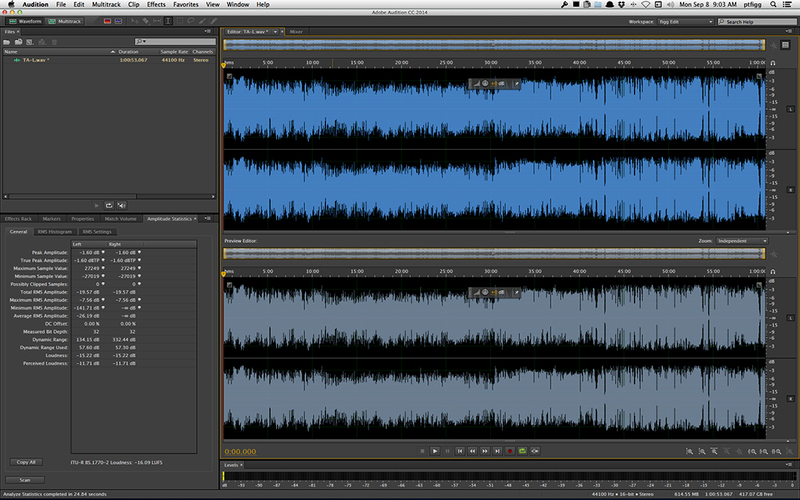 Of course visual attributes of any waveform are meaningless if the sound quality is compromised. Use those ears to achieve optimum results. It’s important to establish a clear understanding of each processing module and the interactive processing results. If necessary – apply Broadband Noise Reduction and/or Phase Rotation before MaxxVolume in your signal processing chain. Remember – the High Level Compressor Gain does not establish a hard limited compliance ceiling! You will need to Insert a post compliance limiter. 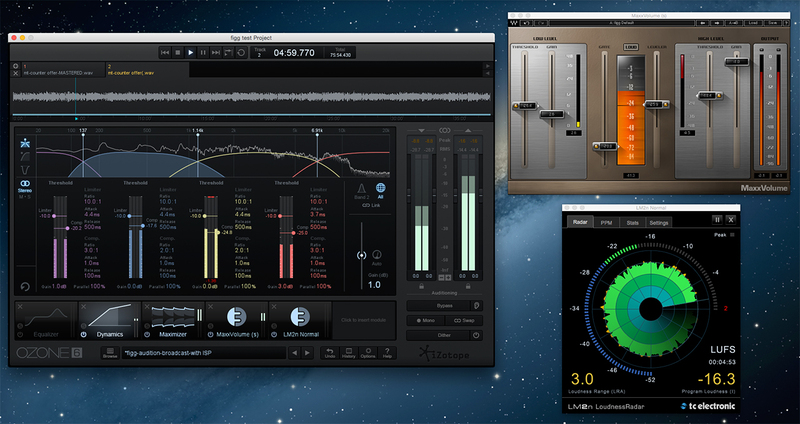 I recommend the following limiters: ISL by Nugen Audio and Elixir by Flux. TrackLimit by DMG Audio is also a worthy consideration. – -> On multiple occasions I’ve expressed how it can be difficult working with non-scalable audio plugins on high-resolution monitors. I am a proponent of defining specific numerical setting values on supported plugins in order to fine tune parameters. Legacy UI designs offered by various developers generally exhibit fuzzy text and difficult to read values. These difficulties are prevalent when running monitor resolutions higher than 1920×1080 (I run a 4k compatible monitor at 2560×1440). In essence, viewing MaxxVolume’s fader values and additional indicators can be visually challenging. – -> Be careful when using the Low Level Compressor. Excessive gain will elevate breaths and boost the audible noise floor. – -> An integrated compliance limiter would be useful. As it stands, the insertion of a down-stream limiter is vital. When recording (spoken word) audio via mic input, the noise floor is perceived as the level of ambient noise and residual preamp noise – NOT the system noise. 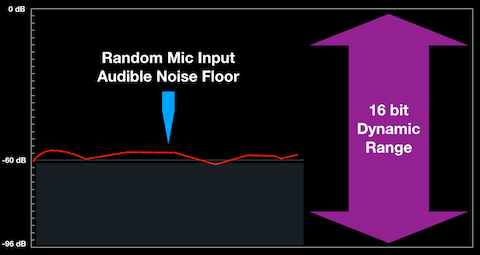 Any such mic input will exhibit a higher perceived noise floor with a reduced SNR compared to a much more efficient DI or electronic instrument. Consider the quantified theoretical dynamic range of 16 bit audio (96 dB). When recording with a mic in a typical environment – your system is incapable of effectively utilizing the full dynamic range of 16 bit audio due to the noted (elevated) perceived noise. When producing Podcast audio, wide dynamics capabilities are irrelevant. In fact persistent wide dynamics in spoken word audio intended for Internet/Mobile/Podcast distribution will compromise intelligibility. With all this in mind, what is the advantage of recording 24 bit (spoken word) Podcast audio with a theoretical dynamic range of 144 dB vs.16 bit audio? In my view there is no advantage, especially when proper down conversion techniques such as Dithering are for the most part ignored. An omission as such will compromise the sonic attributes of down converted audio derived from higher resolution source masters. Are you striving for an efficient Podcast production workflow with excellent fidelity and adequate frequency response? 44.1 kHz (or 48 kHz) • 16 bit audio will be sufficient. Of course there will be optimization variables and requirements such as quality of gear, optimal recording levels, and ample headroom. – If you are producing highly dynamic episodic dramas, fine arts content, or complex narratives with music and sound effects elements – and you prefer to work with 24 bit media … by all means do so. – When down converting from 24 bit to 16 bit in preparation for distribution, recognize the significance of Dithering. – Be aware of MP3 codec filtering attributes, inherent frequency response limitations, artifacts, and the consequences of low bit rate encoding. – Applying a low-pass filter to lossless audio prior to lossy encoding is recommended. Such a roll-off will effectively supply the lossy encoder with managed high frequency activity that is below the codec’s filtering threshold. 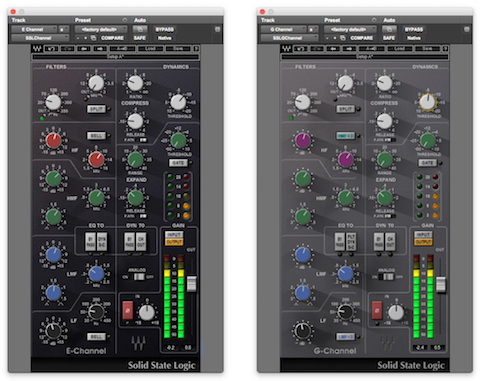 Waves has sporadically released the SSL 4000 Series Channel Strip plugins independently and free from previous bundle restrictions. This is great news. What’s even better is their limited time pricing of $29. On the surface both channel strips feature various equalization stages and dynamics processing modules. There are a few discernible differences between the E-Channel and G-Channel versions. Also, certain shared and/or unique parameters and features are worth discussing. The main difference between the two versions is how certain gain settings within two specific EQ modules affect bandwidth (aka “Q” values). For instance, the E-Channel’s HMF and LMF module bandwidth remains constant at all gain levels. Conversely, the G-Channel’s HMF and LMF module bandwidth will vary based on the gain level settings. Specifically, as a filter’s gain level is increased or decreased, the bandwidth narrows and potentially becomes more surgical. Both versions include a Split option within the High-Pass/Low-Pass filter modules. When activated, the filters are placed before the dynamics modules. The E-Channel’s HF and LF eq modules are (by default) Shelving Filters. Pressing the BELL selector changes their attributes as described. The G-Channel’s HF and LF eq modules feature fixed Shelving Filters. As well, the HMFx3 option multiples the HMF frequency by three. The LMF /3 option divides the LMF frequency by 3. The E-Channel’s Dyn S-C option inserts the filters and EQ into the dynamics sidechain for frequency sensitive processing. The G-Channel’s FLT Dyn S-C option inserts the filters into the dynamics sidechain (Note: “filters” refers to high-pass/low-pass modules). The Compressor features soft-knee processing with automatic makeup gain. The default attack time is slow and program dependent. Activating F.ATK sets the attack time to 1 ms. The Compressor will function as a limiter when it’s ratio is set to infinity (Note: attack time attributes are the same in the Expander/Gate module). Both versions include a switchable Analog Emulation stage, Phase Reverse, Input Trim, and Output Fader. The Level Meters are switchable for Input and/or Output level monitoring. What is a Compellor? In short it is a Compressor-Leveler-Limiter. The device is specifically designed for the transparent control of audio levels. It operates as a stereo processor or as a two-channel (mono) processor supporting independent channel control. Additional features include a Dynamic Release Computer (DRC), Dynamic Verification Gate (DVG), and a Silence Gate. The original device (model 300 Stereo Compellor) was released in 1984. The product line evolved and culminated in 2003 with the release of the 320D. Through the years the Compellor has been widely used in professional broadcast, post houses, recording studios, and live venues. In 2004 I purchased a used model 320A from a radio station. The “A” reference indicates it’s analog circuitry. I’ve used the 320A for countless audio file and tape transfers, post production processing, Telephone/Skype recording sessions, and monitoring. The device provides three selectable Operating Levels … +8dBu, +4dBu, and -10dBV. Recently the complex level and gain reduction metering for the right channel failed. I replaced the faulty 320A with a 320D. This version features digital and analog I/O with common selectable (analog) Operating Levels (+4dBu, and -10dBV). At some point my faulty 320A will be shipped out to Burbank California for authorized service. 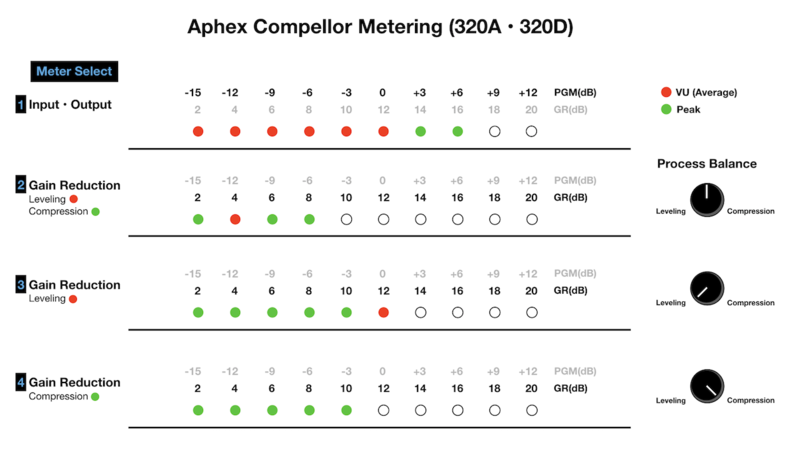 As noted Aphex classifies the Compellor as a Frequency Discriminant Leveler. It responds slower and less aggressively to low frequencies. In essence low frequency energy will not initiate gain reduction. A Dynamic Release Computer (DRC) instantiates program dependent compression release times. The Dynamic Verification Gate (DVG) computes the historical average of peak values and verifies whether measured values exceed or are equal to the historical value. When the signal level is below the average, leveling and compression gain reduction is frozen. The device Drive control sets the preprocessed VCA gain. Higher settings yield a higher level of gain reduction (VCA refers to Voltage Controlled Amplifier). A Rate (speed) toggle option is provided: Fast, suitable for speech/voice, or Slow, suitable for program material such as produced TV and/or Radio programs. The device Output control normalizes the processed audio to 0VU. Silence Gate: Aphex stresses – this is not an audio gate! It is a user defined threshold parameter. When the signal drops below the threshold for 1 sec. or longer, the Silence Gate freezes the VCA gain. This prevents the buildup of noise during pauses and/or extended passages of silence. The device Limiter features a very fast attack and high threshold. It is designed to prevent occasional high transient activity and overshoots. A Stereo Enhance mode is available on the 320A and 320D models. When activated it widens the stereo image. It’s effect is dependent upon the amount of applied compression. The 320D Compellor features three, bi-color (red, green) LED metering modes: Input, Output, and Gain Reduction. For Input/Output metering – the red LED’s indicate VU/average. Green LED’s indicate peak level. When the meter is set to display gain reduction (“GR”), the green LED’s indicate total gain reduction. Depending on the Process Balance control weighting – a floating red LED may appear within green LED instances. The floating red LED indicates Leveling gain reduction. If Leveling gain reduction is in fact occurring, the total gain reduction will be indicated by the subsequent green LED(s). Example 1 displays Input or Output metering with an average (red) level of 0VU and a peak (green) level of +6dB. This translates to a +4dBu average level and a +10dB peak level (analog OL set to +4dBu). 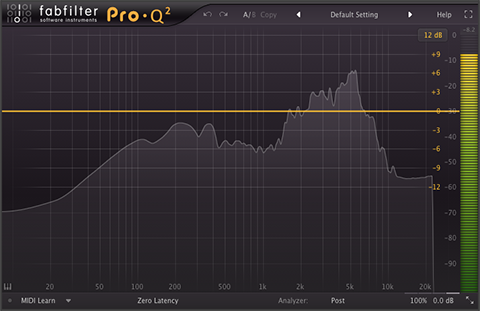 Example 2 displays 4dB of Leveling Gain Reduction and 8dB of Total Gain Reduction. Example 3 displays 12dB of Leveling Gain Reduction. Example 4 displays 10dB of Compression Gain Reduction. **Notice the position of the Process Balance control for examples 2, 3, and 4. The 320D is essentially an analog processor utilizing standard XLR I/O jacks. The device also includes AES/EBU XLR jacks along with an internal DAC for digital I/O. The Input mode and/or Sample Rate is user selectable. When implementing digital I/O – the Incoming audio is converted to analog as it passes through the device. The audio is then converted back to digital and output accordingly. The digital input is calibrated internally and matches -20dBFS to 0VU on the Compellor’s meter. The +4dBu/-10dBV Operating Level options only affect the analog I/O. The Aphex Compellor is a long standing, highly regarded, and ubiquitous audio processor. It has been an integral multipurpose tool for me for 12+ years. My newly purchased (used) 320D is in near mint condition. In fact it looks and feels as if it was hardly used by the previous owner. My system includes additional Aphex audio processors (651 Compressor, 109 EQ, 622 Expander/Gate, and a 720 Dominator II Multiband Peak Limiter). As well, a Mackie Onyx 1220i Mixer, Motu I/O, dbx 160A Compressor, dbx 286A Mic Processor, Marantz CF Recorder, and a Telos One Digital Hybrid. All components, with the exception of the 286A – are interfaced through a balanced Patchbay. A typical processing/monitoring chain will pass system audio through the Compellor, followed by the 720 Peak Limiter. The processed audio is ultimately routed to the system’s Main Output(s). This chain optimizes playback of poorly produced Podcasts, VO’s, live streams, or videos. The routing is implemented via Patchbay. A typical audio processing chain will route Pro Tools audio out via hardware insert (or bus, alternative output, etc.) through the Compellor (or a more complex chain) and returned in Pro Tools. In this scenario I use a set of assignable interface line inputs/outputs. The routing is implemented via Patchbay. I document the setup and use of hardware inserts here. LevelView by Grimm Audio is a highly functional and well designed real time Loudness Meter. LevelView features a unique multifaceted Rainbow Meter. Clicking the Rainbow display toggles the Meter scale (EBU +9 or EBU +18). There are three compliance modes: EBU R128, ATSC A/85, and a custom User specification (Gated or Ungated). The Rainbow Meter displays a Relative Scale. Consequentially the defined target will be equivalent to 0 LU. The upper blue Rainbow arc represents Short Term Loudness measured within a 3 sec. time frame. The inward blue arcs indicate slower time frame variances (10, 30, 90, and 270 seconds). The arced needle meter located above the Rainbow Meter represents the Momentary Loudness measured within a 400ms time frame. Visual dots displayed (and held) on both the Momentary and Short Term Loudness indictor plots represent the maximum values for each descriptor. Both indicators will shift to orange when their values exceed recognized guidelines (+8 max M, and +6 Max S). The numerical descriptor table features a large Integrated Loudness value. 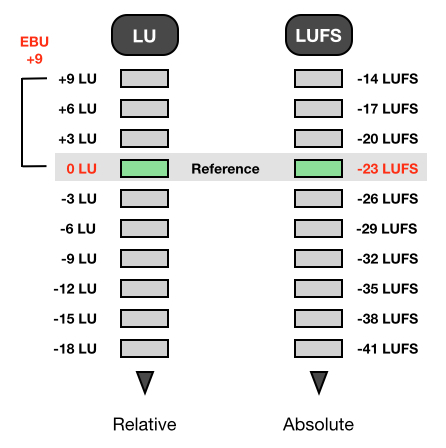 This may display an Absolute Scale value in LUFS, or a Relative Scale value in LU’s. Clicking the descriptor text toggles it’s view. Additional numerical descriptors include maximum Momentary Loudness (max M), maximum Short Term Loudness (max S), LRA (Loudness Range), PLR (Peak to Loudness Ratio), and maximum True Peak (max TP). Clicking the max TP descriptor text will toggle the measurement algorithm and display max TP or max SP (Sample Peak). Descriptors will shift to orange when a displayed value exceeds recognized or specification guidelines. The graph located at the lower left is the Loudness Range histogram. It displays the distribution of the measured Loudness over time. The data will indicate whether further dynamic range compression may be necessary. LevelView supports Manual start and stop measurements. Setting the meter to Auto will force it to follow the host DAW’s transport. In essence the meter will automatically start/stop and reset based on the status of the transport. It is possible to run various connected (Host and Client) instances of LevelView on a network or over the Internet. I will be testing these options in the near future. LevelView is available as an AU, VST, or AAX Plugin. The AU and VST versions support (5.1) Surround Sound measurement. The meter conforms to the SMPTE/ITU channel matrix standard (L-R-C-LFE-Ls-Rs). 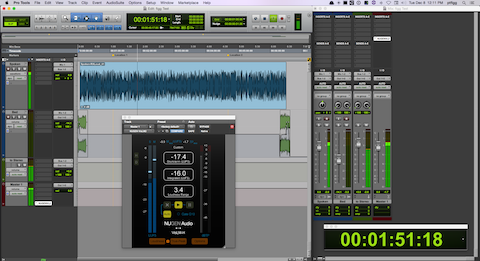 The meter may also run in a stand-alone mode with no DAW dependency. I/O configuration options are provided. I like this meter and I appreciate it’s unique design and accuracy. The networking options, support for Surround Sound, and stand-alone capability make it highly flexible and well worth it’s reasonable cost ($70 U.S. at Don’tCrack). I’m happy to recommend it. – I continue to endorse -16.0 LUFS for (stereo) Podcast distribution. If meeting this target requires an excessive amount of limiting, a slightly lower target is a viable option. However from my perspective a -20.0 LUFS spoken word piece consumed in a less than ideal environment on a mobile device would be problematic. I’m comfortable supporting upwards of a -2.0 LU deviation from the recommended -16.0 LUFS target (when applicable). **Note mono files require a -3 LU offset to establish perceptual equivalence to stereo file targets. – Loudness Range (LRA) is a statistical representation of Loudness distribution and/or the Loudness measurement. An LRA no higher than 8 LU will help optimize intelligibility by restricting dynamics and/or wide variations in Loudness over time. – Networks and Catalog based program sets managed by indie producers must institute Program Loudness consisctency across all distributed media. This will free listeners from making constant playback volume adjsutments when listening to several programs in succession. Up to 1.0 LU tolerance (+/-) is reasonable. However upside Program Loudness should never exceed -16.0 LUFS. – Without sufficient headroom – lossy, low bitrate encoding may generate peak levels that exceed a compliance ceiling and/or introduce distortion. -1.5 dBTP is the favored maximum ceiling prior to lossy coding. Of course a lesser value (e.g -2.0 dBTP) is appropriate. However, a peak ceiling below -3.0 dBTP may indicate excessive limiting. This should be avoided. 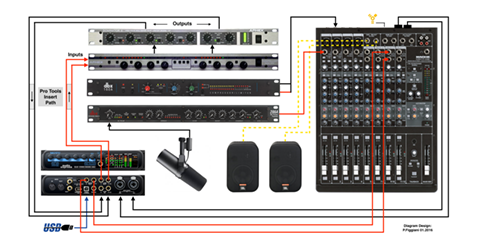 The attached image displays a processing workflow designed to optimize Spoken Word intelligibility. The workflow also demonstrates a realtime example of Integrated Loudness/Maximum True Peak compliance targeting. 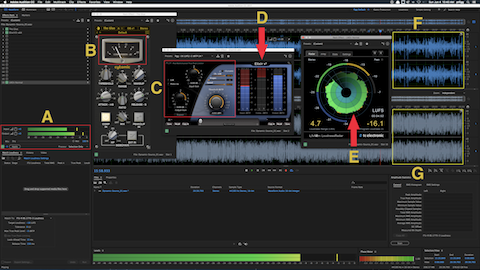 Section A includes the Adobe Audition Effects Rack Signal Level Meters indicating the source (Input) level and the (Output) level. The Output level reflects the results of the workflow’s inserted plugins. The chain includes a Compressor, a Limiter, and a Loudness Meter. Note the level meters indicate signal level. They do not indicate or represent perceptual Loudness. Section B displays the gain reduction applied by the Compressor at the current position of the playhead. For the test/source audio I determined an average of 6dB of gain reduction would yield acceptable results. The purpose of this stage is to reduce the dynamic range and/or dynamic structure of the Spoken Word resulting in optimized intelligibility AND to prevent excessive down stream limiting. This is an important workflow element when preparing Spoken Word audio for Internet/Mobile, and Podcast distribution. Section C includes my subjective limiting parameters. The Limiter will add the required amount of gain to achieve a -16.0 LUFS deliverable while adhering to a -1.5 dBTP (True Peak Max). If the client, platform, or workflow requires an alternative Loudness target and/or Maximum True Peak ceiling – the parameters and their mathematical relationship may be altered for customized targeting. Please note the Maximum True Peak referenced in any spec. is more of a ceiling as opposed to a target. In essence the measured signal level may be lower than the specified maximum. Section D indicates the amount of limiting that is occurring at the current position of the playhead. Section E displays the user defined Integrated Loudness target located above the circular Momentary Loudness LED (12 o’clock position). The defined Integrated Loudness target is also visually represented by the Radar’s second concentric circle. The Radar display indicates the Short Term Loudness measured over time within a 3 sec. window. The consistency of the Short Term Loudness is evident indicating optimized intelligibility. Section F displays the unprocessed source audio that lacks optimization for Internet/Mobile, and Podcast distribution. Any attempt to consume the audio in it’s current state in a less than ideal listening environment will result in compromised intelligibility. Mobile device consumption in like environments will exacerbate compromised intelligibility. Section G displays the processed/optimized audio suitable for the noted distribution platform. The Integrated Loudness, True Peak, and LRA descriptors now satisfy compliance targets. Notice there is no indication of excessive limiting. It is possible to record two (or more) independently connected Skype clients on discrete tracks on a single computer in RT. The workflow requires independent Mix-Minus feeds configured in a supported DAW such as Pro Tools or Logic Pro. (Scenario A) Typical Podcast consisting of a Host + Skype Guest + Skype Guest. 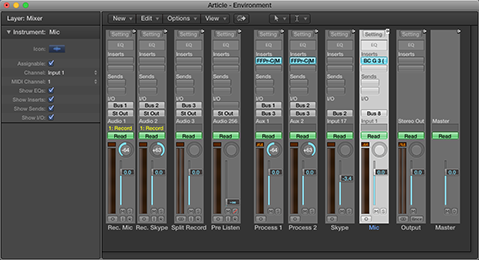 Dual Mix-Minus feeds are implemented in the Host’s DAW. All participants recorded on discrete tracks in RT utilizing two individual incoming Skype clients running simultaneously on the Host system. (Scenario B) Engineer + Skype Session Participant + Skype Session Participant. Dual Mix Minus feeds are implemented in the Host’s DAW. Both participants recorded on discrete tracks utilizing two individual incoming Skype clients running simultaneously on the Host system. Scenario B describes an engineering session providing support for independently located remote Skype participants who seek recording and post services. The workflow frees the participants from recording responsibilities and file management. As noted both Scenarios require the use of two individual Skype clients running simultaneously on the Host/Engineer’s system. This concept is publicly documented using various methods. In fact our good friend Mike Phillips describes an example workflow in this article. What differentiates my workflow is the use of virtual routing within the Recording Session on a single machine. 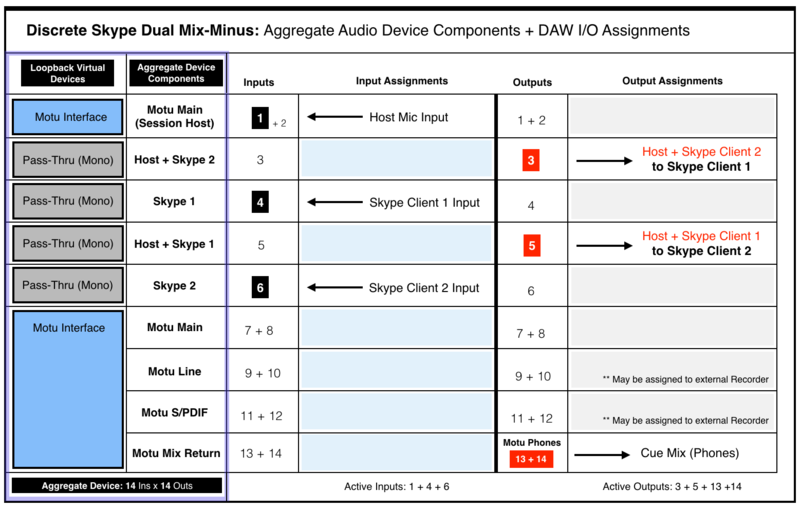 Dual Mix-Minus feeds are implemented in the Host’s DAW with zero dependency on hardware Aux Sends. Loopback by Rogue Amoeba is used to create Virtual Devices and Pass-Thru’s. They will be encapsulated in an Aggregate Audio Device created in OSX. Additionally, my working Motu Audio Interface (8×8) will be added to the Aggregate Device for maximum flexibility. 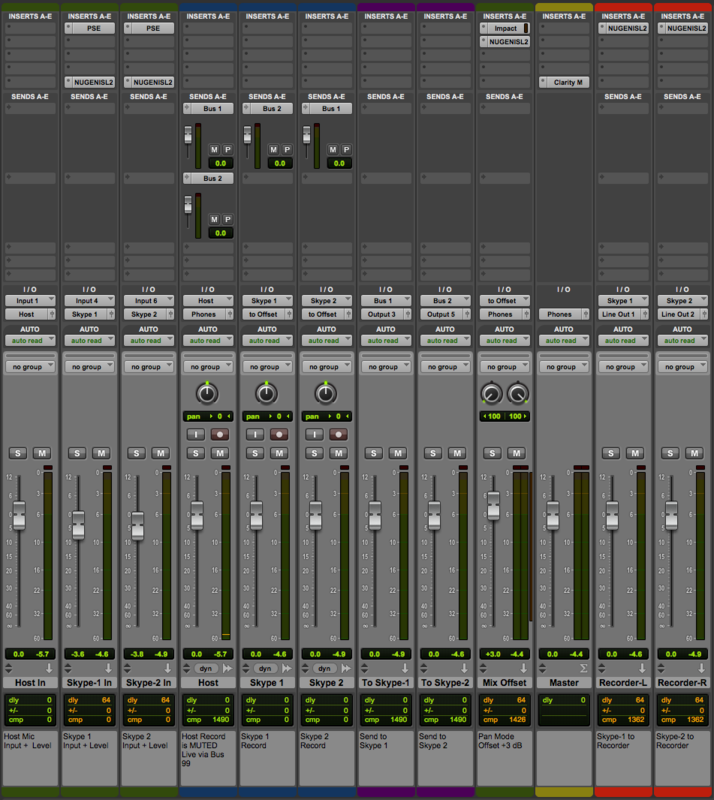 The intent of a single Mix-Minus feed is to send a Host’s audio back to a Session participant. This is commonly implemented on a hardware mixer or console using an Aux Send. It is nothing more than a discrete audio output with a level control. When adding a second participant, the Host’s audio is routed to both participants using two Aux Sends (A), (B). The implemented Sends are also used to establish communication between the included participants. Additional output routing will be necessary for monitoring and external recording. We will address this in a moment. Column 1 lists six Virtual Devices created in Rogue Amoeba’s Loopback application. Column 2 lists their associated user defined names. • An initial Motu Audio Interface instance is created with inputs/outputs 1+2 mapped for use. Input 1 will represent the Host Mic. • A secondary Motu instance is created with all available inputs/outputs mapped for use (8×8 by default). This will supply additional routing flexibility for monitoring and external recording. In fact the I/O Matrix table displays the use of outputs 13+14 for the Cue Monitor Mix (Phones). Note the Inputs and Outputs are purposely alternated to prevent direct patching and subsequent feedback. These user defined Loopback Virtual Devices will appear in the Mac OSX Audio MIDI Setup utility. They can be used individually. They can also be combined, thus creating a cumulative (Aggregate) Audio Device. 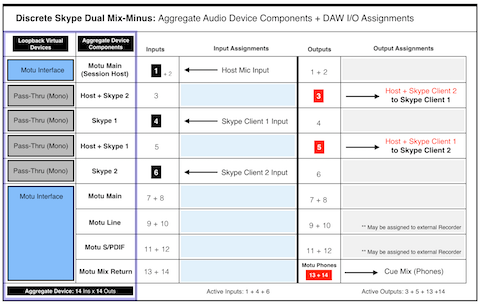 We will utilize both options (individual Virtual Devices for Skype Clients + cumulative Aggregate as the DAW’s default I/O). 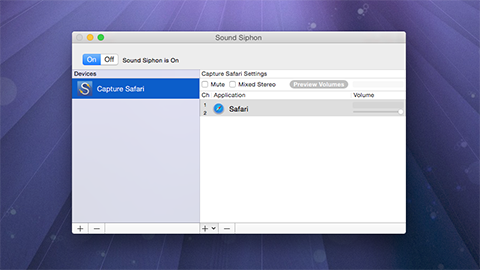 The image below displays a user defined Aggregate Audio Device created in OSX using the Audio MIDI Setup utility. It is named Skype (Dual) MixMinus. Notice how I’ve selected the Virtual Devices created in Loopback as Subdevices. Also notice how each Subdevice accurately displays input and output I/O mapping for a total of 14 inputs + 14 outputs. This matches the configuration displayed in the I/O Matrix table diagram above. The Aggregate Audio Device is now ready for DAW integration. For this demonstration I will be using Pro Tools with the Skype (Dual) MixMinus Aggregate set as the Playback Engine (it’s default Session I/O). This configuration has also been successfully implemented in Logic Pro X. It has not been tested in Adobe Audition. The Chanel Strip configuration will be described in sequential order. Please note the described Session configuration is more complex than what is required. The first 3 Channel Strips (Green) are mono Auxiliary Inputs. Their assigned Inputs are the Host Mic, Skype Client 1, and Skype Client 2. Notice how the assigned inputs match the input configuration as displayed in the I/O Matrix table diagram (1 + 4 + 6). The Faders on these Channel Strips function as input level controllers for each source input before the signals reach the pre-fader recording tracks. Two audio plugins are inserted on each Skype Client input Channel Strip (Downward Expander and Limiter). The Expanders will transparently attenuate the inactive input. The Limiters will function as a safeguard thus preventing unexpected signal level overload. Plenty of headroom is maintained. In essence the Limiters will rarely engage. The outputs of the source input Channel Strips are routed (via virtual Buses) to the inputs of 3 standard mono Audio Channel Strips (Blue). When armed, they will record the source inputs discretely. The Host Channel contains 2 active Sends passing audio to Bus 1 and Bus 2. The Skype 1 Channel contains 1 active Send passing audio to Bus 2. The Skype 2 Channel contains 1 active Send passing audio to Bus 1. 2 additional Auxiliary Input Channel Strips (Purple) receive signal from Send Buses 1 + 2. • The To Skype-1 input is set to Bus 1. This Bus includes the tapped Host audio and the tapped Skype 2 client audio. It’s output is set to Output 3. • The To Skype-2 input is set to Bus 2. This Bus includes the tapped Host audio and the tapped Skype 1 client audio. It’s output is set to Output 5. Notice how the assigned outputs (3 + 5) match the output configuration displayed in the I/O Matrix table diagram. 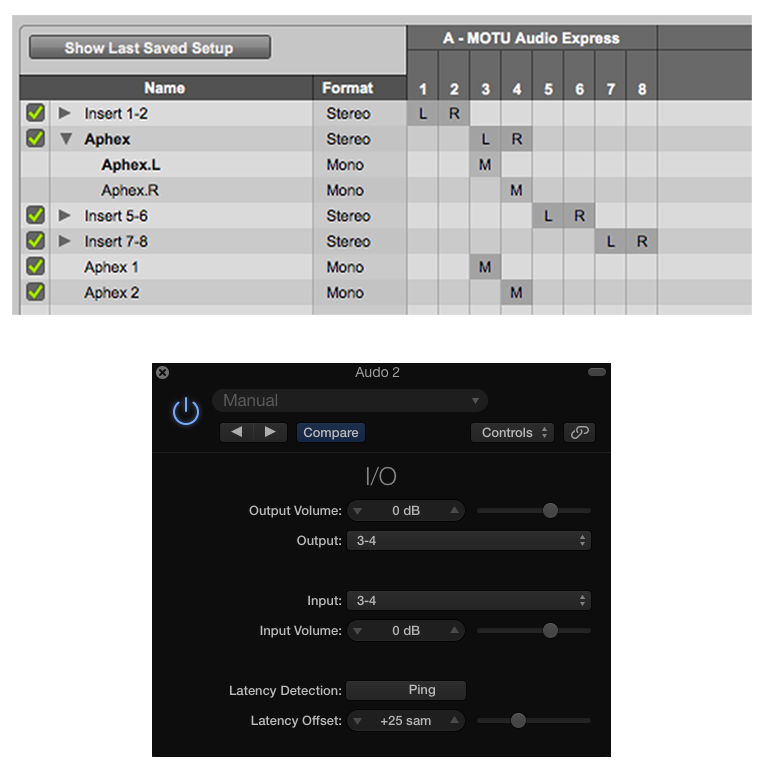 Pro Tools attenuates center-panned mono tracks according to a user defined Pan Depth setting. My setting is always -3 dB. Notice the outputs of the Skype 1 and Skype 2 audio tracks are routed to a stereo Bus labeled to Offset. An Auxiliary Input Channel Strip (Green, labeled Mix Offset) receives the audio from the to Offset virtual Bus. I use the Channel Strip fader to add +3 dB of static gain to reconstitute the previously applied attenuation on the passing signal. The Mix Offset Channel Strip’s output is set to Phones. This signal path represents the Interface Headphone outputs (13+14). They are referenced in the I/O Matrix table diagram. The Master Fader’s (Yellow) output is also set to Phones. This configuration allows the engineer to monitor the Skype participants via headphones connected to the Motu Interface. Notice the output for the Host Audio Track is set to Mute Bus. This is an unassigned virtual Bus. The Host Mic input is directly monitored (also via headphones) through the Motu Interface. Setting the Host channel output to the Session’s Phones output Bus will blend the hardware monitored mic signal with the slightly latent Session output. Using the unassigned Bus solves this. Of course in Post the hardware monitored signal will be absent. In this case the output must be reassigned to the Phones output Bus. In preparation for recording, two independent instances of Skype (using unique accounts) must be launched on the Host System. 1) Launch Skype as normal and login to your primary account. Notice we revert back to independent Virtual Devices created in Loopback for the configuration of this Skype instance. The Host + Skype 2 device is essentially output 3 in the configured DAW. It passes the Host + Skype Client 2 audio to this running instance of Skype. [Speakers: Skype 1] is mapped to input 4, previously assigned in the DAW’s configured Session. (I created an executable Shell Script that runs the displayed command. Once created, simply double click it’s icon to launch Skype). A second instance of Skype will launch and prompt you for credentials. Login using your secondary Skype account. Once again we revert back to independent Virtual Devices created in Loopback for the configuration of this Skype instance. 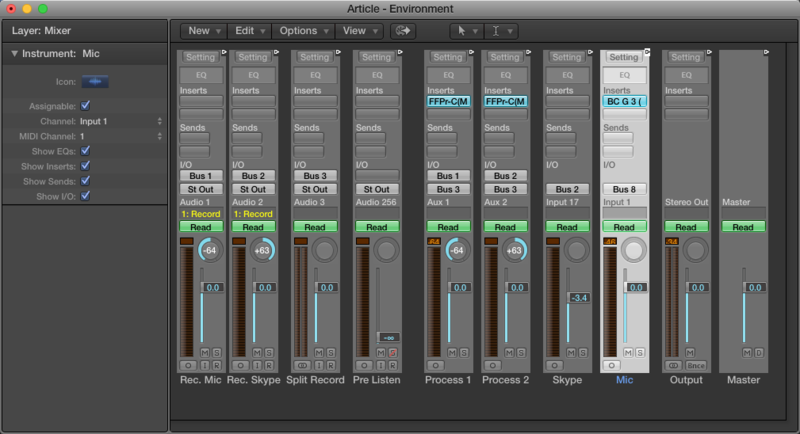 The Host + Skype 1 device is essentially output 5 in the configured DAW. It passes the Host + Skype Client 1 audio to this running instance of Skype. [Speakers: Skype 2] is mapped to input 6, previously assigned in the DAW’s configured Session. After launching and configuring the Skype instance(s), arm the DAW’s Host, Skype 1, and Skype 2 audio tracks for recording. Connect with the independent Skype participants. Both participants will be able to converse with each other + the Host. Recording the Session will supply discrete audio files for each participant on their respective tracks. In the I/O Matrix diagram you will notice the availability of two sets of stereo outputs (9+10 , 11+12). They represent the Line Outputs and the S/PDIF output on the Motu Interface. Remember the Interface is a Subdevice within the defined Aggregate Device. 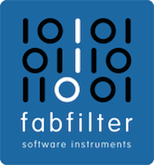 As a result the noted inputs and outputs are available within the DAW Session for patching. 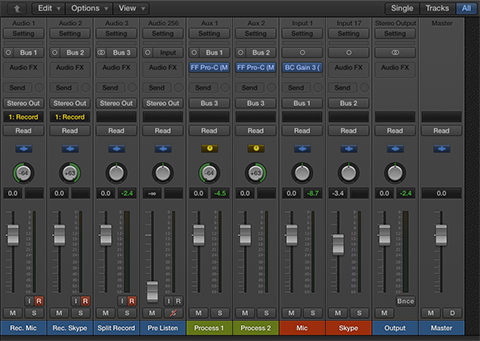 Also notice the last two Channel Strips (Red) displayed in the Session mixer. They are Auxiliary Input Channel Strips. Their inputs are assigned to the Skype 1 and Skype 2 output Buses. Each Channel Strip output is mapped to corresponding Motu Interface Line Outputs and finally patched to the L+R inputs of an external solid state stereo recorder. In this particular example only the Skype Participants will be recorded externally. My intension is to engineer Sessions containing two remote clients. In this case it’s a viable solution for out of the box Session recording. You will notice a few additional Audio Plugins inserted on various Channel Strips. A Mix Bus Compressor and a Limiter are inserted on the Mix Offset Channel Strip. The Inserts located on the Master Fader are post fader. Here I’ve inserted the Clarity M routing plugin. This passes the signal to an external (hardware) Loudness Meter via USB. Finally I’ve inserted Limiters on each of the external recorder Buses. Again they are set to maintain maximum headroom, and only exist to prevent unexpected signal level overload before the audio reaches the recorder. Of course Plugin implementation in general will be subjective. The complexity of the Session can be customized or even minimized to suit your needs. Basic requirements include a properly configured Aggregate I/O, 3 audio tracks capable of recording, 2 Aux Sends, and a Master Fader. The dual Skype requirement is necessary and straightforward. It is possible to add support for additional running Skype clients. This will require additional (mono) Loopback Pass-Thru Virtual Devices, and further customization of the Aggregate Audio Device + DAW Session. I defined custom Incoming Connection Ports for each Skype Instance. This option is available in Skype Preferences/Advanced. Port Mapping was managed in my Router’s configuration utility. I closely monitored System Resources throughout testing and checked for potential deficiencies. Pro Tools performed well with no issues. Each running instance of Skype displayed less than 14% CPU usage. Memory consumption was equally low. Note my Quad 2.8 GHz Mac Pro has 32 gigs of RAM and four dedicated media drives. Undoubtedly someone will state this implementation is “much too complicated for the common Podcaster,” or even “Broadcaster.” With respect I’m not necessarily targeting novices. Regardless, you will most certainly require skills and experience in DAW and I/O signal routing. Please note a Mix-Minus feed in general is not some sort of revelation. It’s pretty basic stuff. You’ll need a full understanding of it as well. If you have questions I am happy to help. If you would like to participate in a test, ping me. If you are overwhelmed please revert to a service such as Zencastr. Logic and Audition users will be familiar with the term Bounce to Track. This process allows the user to perform an Off-line Mixdown of a selected group of Session Tracks without physically exporting. In most cases the Mixdown appears on a supplemental target Track. Bouncing Off-line is a time saver. However it can be precarious. It would be irresponsible to submit a finished piece of audio to a client without 100% conformation the bounced delivery file (most likely slated for distribution) is glitch free. In essence it is imperative to throughly check your piece prior to submission. Off-line Bounce (aka Bounce to Disk) was once notoriously absent from Pro Tools. Avid finally implemented support a few years ago. In professional Post Production, engineers may perform a real time (On-line) Bounce of a mix Session. The process is commonly referred to as Printing. It requires the operator to sit through the Session in it’s entirety. Besides glitch detection capabilities, it is possible to edit clips before the playhead reaches their location. As well, you can edit clips and/or sub-segments within a previously completed Print and only re-Print the manipulated segment. So how is this done? Simple – if the DAW or Interface supports it. For instance in Pro Tools the user can assign Bus outputs to the input of a standard Audio Track. The key is you can ARM a standard Audio Track to record any signal that is passing through it. This would be the Print Track. Adobe Audition CC does not support direct Bus Output —>> Audio Track assignments. However, it is still possible to implement a Print workflow (see attached image). You will need a supported Audio Interface with a Mix Return. Simply assign all Session Tracks and Buses to the Main Output. 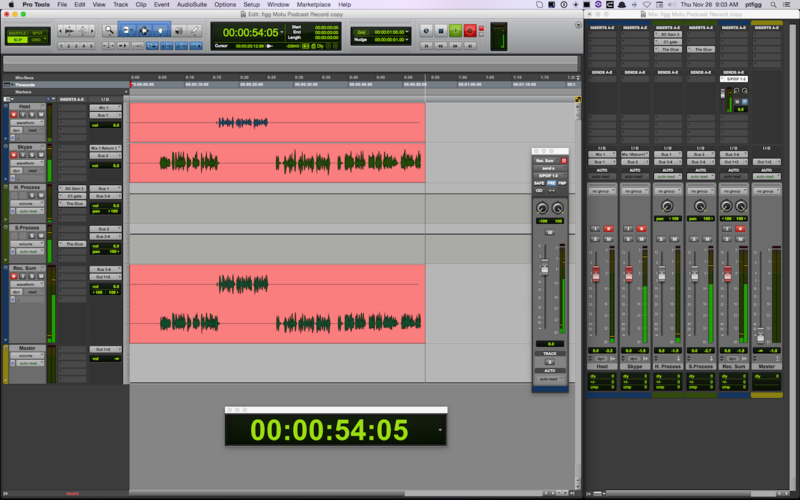 Then add a supplemental Audio Track. Set it’s input to Mix Return. ARM the Track to record and fire away. I thought I’d revisit various aspects of Loudness Meter Absolute/Relative Scale correlation, and provide a visual representation of a real time processing Session with both Scales active. The most common is an Absolute Scale, displayed in LUFS or LKFS. LUFS refers to Loudness Units relative to Full Scale. LKFS refers to Loudness Units K-Weighted relative to Full Scale. There is no difference in the perceptual measured loudness between both descriptor references. It is also possible to measure and display Integrated/Program Loudness as Loudness Units (or LU’s) on a Relative Scale where 1LU == 1 dB. When shifting to a Relative Scale, the 0 LU increment is always equivalent to the Meter’s user defined or spec. defined Absolute Loudness target. For example, in an R128 -23.0 LUFS Absolute Scale workflow, setting the Meter to display a Relative Scale changes the target to 0 LU. So – if a piece of measured audio checks in at -23.0 LUFS on an Absolute Scale, it would be perceptually equal to measured audio checking in at 0 LU on a Relative Scale. Likewise if the Meter’s Absolute Scale target is set to -16.0 LUFS, it will correlate to 0 LU on a Relative Scale. Again both would reflect perceptual equivalence. Please note Loudness Units are also the proper way in which to describe Loudness differentials between two programs. For instance, “Program (A) is +2 LU louder than Program (B).” One might also describe gain offsets in LU’s as opposed to dB’s. Hornet Plugins recently released Hornet LU Meter. This tool is a Loudness Meter plugin designed to measure and display Integrated/Program Loudness within a 400ms time window. This measurement represents the Momentary Loudness descriptor. The Meter is indeed nifty and affordable. However there is one sort of caveat worth noting: As the name suggests, it is an LU Meter. In essence Integrated (Momentary) Loudness measurements are solely displayed on a Relative Scale. 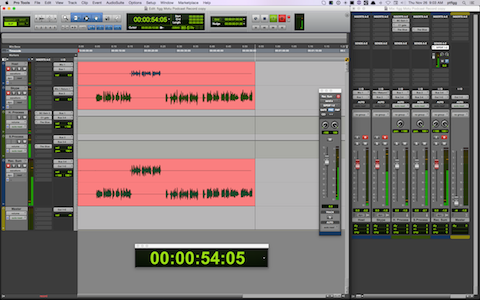 The displayed Session (image) consists of a single mono VO clip. The objective is to print a processed stereo version in RT checking in at -16.0 LUFS with a maximum True Peak no higher than -2.0 dBTP. The output of the mono VO track is routed to a mono Auxiliary Input track titled Normalize. If you are not familiar with Pro Tools, an Auxiliary Input track is not the same as an Auxiliary Send. Auxiliary Input tracks allow the user to pass signal using buses, insert plugins, and adjust level. They are commonly used to create sub-mixes. I’ve inserted a Compressor and a Limiter on the Normalize Auxiliary Input track. 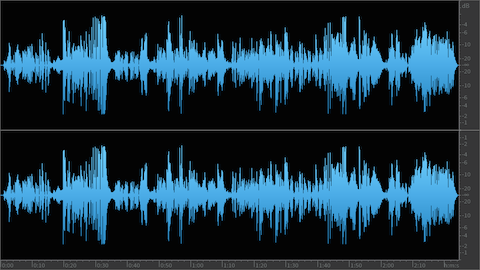 The processed audio is passing through at -19.0 LUFS (mono). The audio is then routed to a second (now stereo) Auxiliary Input track titled Offset. I use the track fader to apply a +3 dB gain offset, This will reconstitute the loss of gain that occurs on center panned mono tracks. 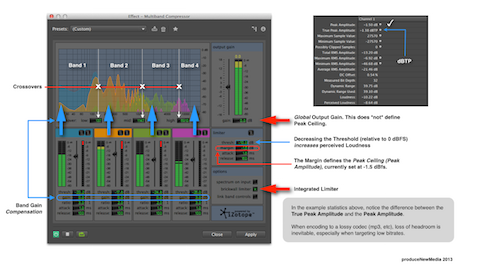 The attenuation is a direct result of the Pro Tools Pan Depth setting. The signal flow/output is now passing -16.0 LUFS audio. It is routed to a standard audio track titled Print. When this track is armed to record, it is possible to initiate a realtime bounce of the processed/routed audio. Notice the instances of the Hornet LU Meter and TC Electronics Loudness Radar. Both Meters are inserted on the Master Bus and are measuring the session’s Master Output. I set the Reference (target) on the Hornet LU Meter to -16.0 LUFS. In essence 0 LU on it’s Relative Scale represents -16.0 LUFS. Conversely the TC Electronic Meter is configured to display Absolute Scale measurements. The circular LED that borders the Radar area indicates Momentary Loudness. The defined Integrated Loudness target is displayed under the arrow at the 12 o’clock position. Remember the Hornet LU Meter solely displays Momentary Loudness. If you compare it’s current reading to the indication of Momentary Loudness on the TC Electronic Meter, the relationship between Relative Scale and Absolute Scale measurement is clearly indicated. Basically the Hornet Meter registers just below 0 LU. The TC Electronic Meter registers just below -16.0 LUFS. I will say if you are comfortable monitoring real time Momentary Loudness and understand Relative/Absolute Scale correlation, the Hornet tool is quite useful. In fact it contains additional features such as Grouping, auto/manual Gain Compensation, and auto-Maximum Peak protection. K-weighting suggests de-emphasized low frequencies by way of a high-pass filter. A high-shelving filter is applied to the upper frequency range, and the measured data is averaged. Certain ISP/True Peak Limiters provide added compliance processing flexibility. Case in point: Elixir by Flux. 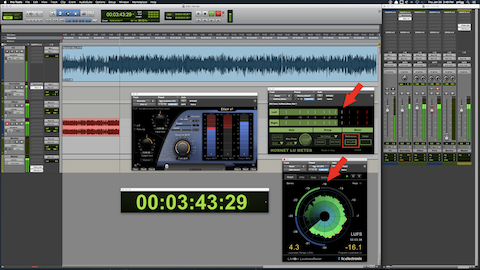 Before processing or Loudness Normalizing, execute an offline measurement on an optimized source clip. An optimized audio clip may exhibit the benefits of various stages of enhancement processing such as noise reduction and dynamic range compression. The displayed clip (see attached image) checks in at -19.6 LUFS. 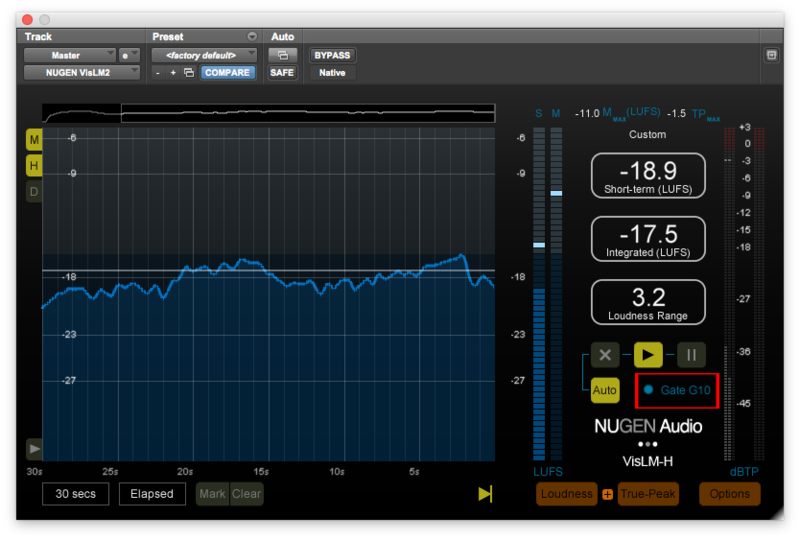 It requires +3.6 dB of gain to meet a -16.0 LUFS Integrated Loudness target. Based on the pre-existing peak ceiling approximately 1.5 dB of limiting will be necessary to establish a -2.0 True Peak maximum. 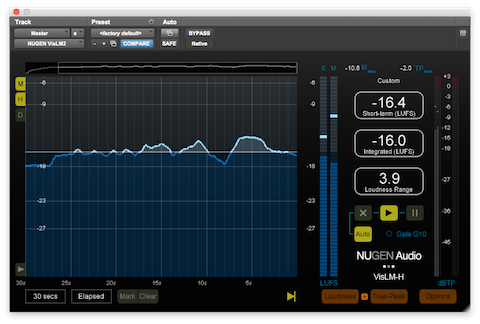 We use the Limiter’s Input Gain setting to take the clip down to -24.0 LUFS (-4.4 dB for the measured displayed clip). The initial -24.0 LUFS target will restore headroom and establish a consistent starting point for downstream limiting accuracy. This will allow the Threshold and Output Gain settings to be recognized and implemented as static parameters for all -16.0 LUFS/-2.0 dBTP (stereo) processing. The Input Gain setting however will be variable based on the measured attributes of the optimized source. Set the Threshold to -10 dB(TP) and the Output Gain to +8dB. The processing may be implemented offline or in real time. The output audio will reflect accurate targets (-16.0 LUFS/-2.0 dBTP) and the applied limiting will be transparent. The proprietary functional parameters included on the Elixir Limiter are not necessarily included on Limiters designed by competing developers. In essence the described workflow may need to be customized based on the attributes of the Limiter. The key is the “math” and static parameters never change, unless of course you decide to alter the referenced targets. I wonder how networks will handle potential perceived Loudness inconsistencies between produced Ads and new or preexisting programs? I’ve mentioned my past affiliation with IT Conversations and The Conversations Network, where I was the lead post audio engineer from 2005-2012. Executive Director Doug Kaye built a proprietary content management system and infrastructure that included an automated component based Show Assembly System. Audio components were essentially audio clips (Intros, Outros, Ads, Credits. etc.) 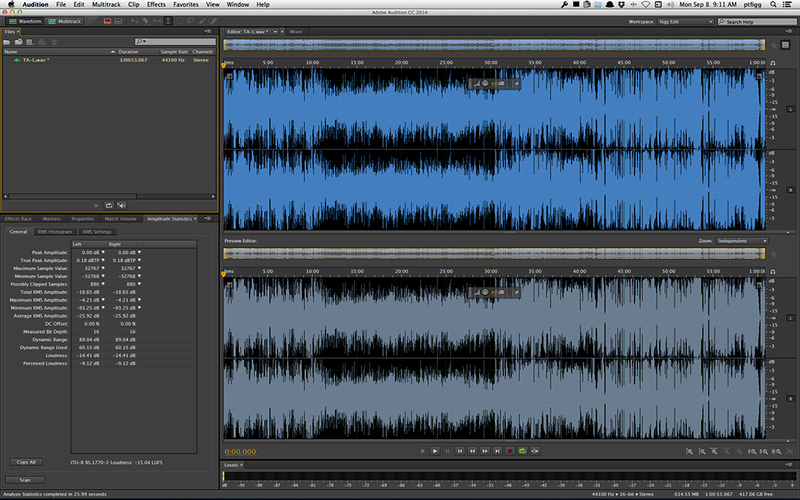 combined server side into Podcasts in preparation for distribution. One key element in this implementation was the establishment of perceived Loudness consistency across all submitted audio components. This was accomplished by standardizing an average Loudness Target using a proprietary software RMS Normalizer to process all server side audio components prior to assembly. 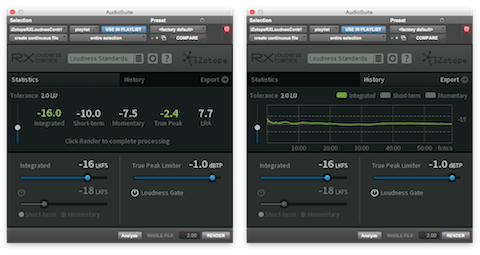 (Loudness Normalization is now the recommended process for Integrated Loudness targeting and consistency). Due to this consistency, all distributed Podcasts were perceptually equal with regard to Integrated or Program Loudness upon playback. This was for the benefit of the listener, removing the potential need to make constant playback volume adjustments within a single program and throughout all programs distributed on the network. Regarding Programmatic Ad insertion, I have yet to come across a Podcast Network that clearly states a set Integrated Loudness Target for submitted programs. (A Maximum True Peak requirement is equally important. However this descriptor has no effect on perceptual Loudness consistency). Due to the absence of any suggested internal network guidelines or any form of standardized Loudness Normalization, dynamic Ad insertion has the potential to ruin the perceptual consistency within single programs and throughout the contents of an entire network. Many conscientious independent producers have embraced the credible -16.0 LUFS Integrated Loudness Target for stereo Internet/ Mobile/Podcast audio distribution (the perceptual equivalent for mono distribution is -19.0 LUFS). It’s far from a requirement, and nothing more than a suggested guideline. My hope is Podcast Networks will begin to recognize the advantages of standardization and consider the adoption of the -16.0 LUFS Integrated Loudness Target. Dynamically inserted Ads must be perceptually equal to the parent program. Without a standardized and pre-disclosed Integrated Loudness Target, it will be near impossible to establish any level of distribution consistency. Below I’ve listed a few Adobe Audition CC (ver.2015.2.1) features/options that may be obscure and perhaps underutilized. 1- Maximize Active Frame (⌘↓). This command toggles full screen display accessibility of the active (blue outlined) UI Panel. 2- Lock In Time (Multitrack). When activated, selected clips are pinned to their current location. I mapped ⌥⌘L for this function. 3- Group (⌘G) (Multitrack). Multiple clips will be congregated and may be repositioned cumulatively. 7- Convert To Unique Copy (Multitrack). This function creates a sub clip derived from the original trimmed source clip. Media Handles are no longer accessible in the converted copy (Multitrack and/or Waveform Editor environments). I mapped ⌥⌘C for this function. 1- Time Selection in all Tracks (Multitrack). This is a Ripple Delete variation (⏎⌘⌦) that will retain clip relevant Marker position(s). 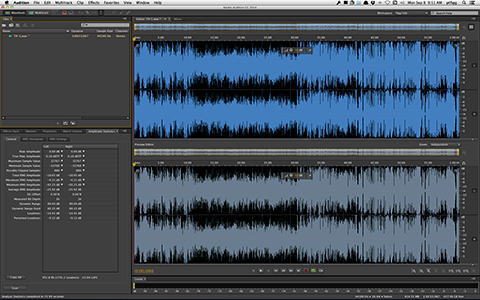 2- Split All Clips Under Playhead (Multitrack). I mapped ⌥⌘R for this function. 3- Merge Clips (remove thru edits) (Multitrack). I mapped ⌥⌘J for this function. 1- Individual Track supplied buttons will designate Sends and Inserts as Pre or Post Fader. 1- Markers implemented in the Waveform Editor may be Merged thus allowing easy selection of encapsulated audio. 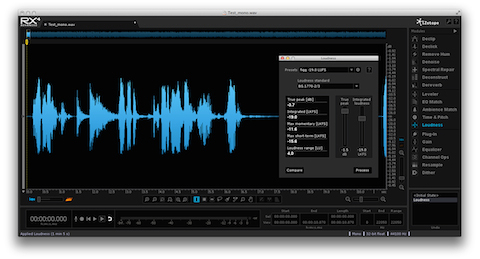 2- Selected Range Markers present in the Waveform Editor may be exported as individual clips. 3- Selected Range Markers present in the Waveform Editor may be added to a Playlist where they may be reordered for auditioning. 2- Export with Adobe Media Encoder (Multitrack). This Export option runs Media Encoder and requires the user to select a predefined Media Encoder preset. Routing options are available as well. Consider this: Two extended segments of audio, Loudness Normalized (or mixed in real time) to the same Integrated Loudness Target. Segment (A) is fairly consistent, with a very limited amount of intermittent silence gaps. Segment (B) is far less consistent, due to a multitude of intermittent silence gaps. When passing both segments through a Loudness Meter (or measuring the segments offline), and recognizing Integrated Loudness is a reflection of the average perceptual Loudness of an entire segment – how will inherent silence affect the accuracy of the cumulative measurements? In theory the silence gaps in Segment (B) should affect the overall measurement by returning a lower representation of average Integrated Loudness. If additional gain is added to compensate, Segment (B) would be perceptually louder than Segment (A). Basically without some sort of active measurement threshold, the algorithms would factor in silence gaps and return an inaccurate representation of Integrated Loudness. In order to establish perceptual accuracy, silence gaps must be removed from active measurements. 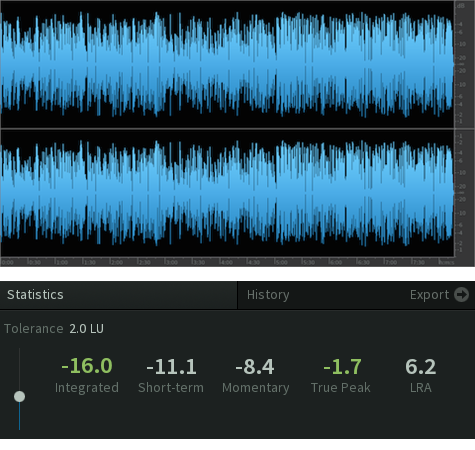 Loudness Meters and their algorithms are designed to ignore silence gaps. The omission of silence is based on the relationship between the average signal level and a predefined threshold. 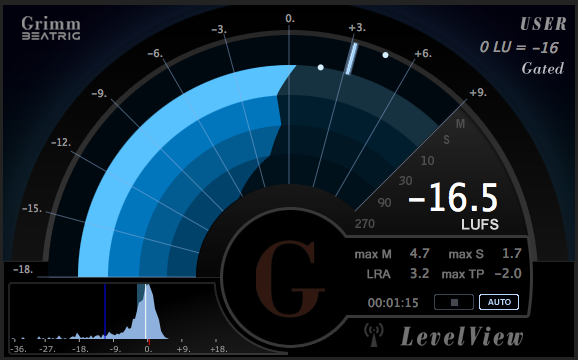 The specification Gate (G10) is an aspect of the ITU Loudness Measurement algorithms included in compliant Loudness Meters. It’s function is to temporarily pause Loudness measurements when the signal drops below a relative threshold, thus allowing only prominent foreground sound to be measured. The relative threshold is -10 LU below ungated LUFS. Momentary and Short Term measurements are not gated. There is also a -70 LUFS Absolute Gate that will force metering to ignore extreme low level noise. Most Loudness Meters reveal a visual indication of active gating (see attached image) and confirm the accuracy of displayed measurements. A Downward Expander and it’s applied attenuation is dependent on signal level when the signal drops below a user defined threshold. The Ratio dictates the amount of attenuation. Alternatively a Noise Gate functions independent of signal level. When the level drops below the defined threshold, hard muting is applied. This is a somewhat proprietary term. 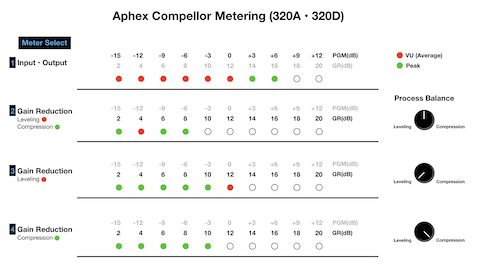 It is a parameter setting available on the Aphex 320A and 320D Compellor hardware Leveler/Compressor. When a passing signal level drops below the user defined Silence Gate threshold for 1 second or longer, the device’s VCA (Voltage Controlled Amplifier) gain is frozen. The Silence Gate will prevent the Leveling and Compression processing from releasing and inadvertently increasing the audibility of background noise. It is possible to implement support for use of external hardware processing components within your software DAW. This support is common in music recording and audio post production environments. When properly implemented, operators have the capability to insert an instance of an external component (or chain) on a DAW audio track just like any other installed third party software plugin. Besides potential tonal advantages, routing through a specialized external component can be less taxing on the host system’s resources. 1 – Your Interface must have an available output (mono or stereo) for routing audio to an external component. You will also need an available input (again, mono or stereo) to accept the processed audio. 2 – Your DAW must support the routing. In the Pro Tools I/O settings you must define a set of available (and matching) Interface inputs and outputs for signal routing. 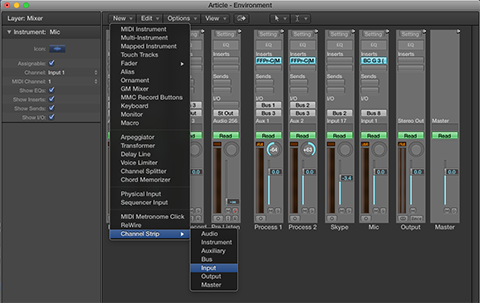 In Logic Pro X, there is an I/O routing option plugin included in the Utility plugins group. 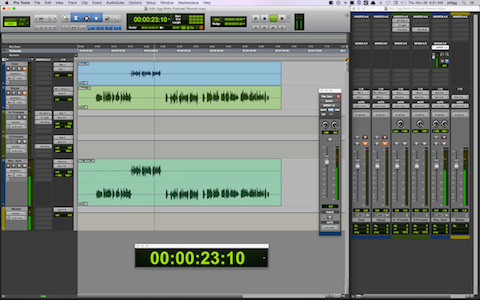 The upper image displays a Pro Tools Insert Routing matrix. The default audio interface has a total of 8 inputs and outputs available as discrete I/O mono channels. They can remain as such. Alternatively, they can be paired to create four stereo signal paths. I’ve defined three instances or parent paths of “Aphex” inserts using interface inputs and outputs 3 + 4. My processing chain supports a stereo signal flow or discrete dual mono. The first Aphex instance is a stereo insert. Clicking the disclosure triangle reveals two associated mono channels that make up the stereo pair. This configuration translates in Pro Tools as a stereo hardware insert or as two discrete mono inserts. At the bottom of the list I’ve also created two custom mono paths the will pass audio to discrete mono component channels. This alternative solution is unnecessary in this particular configuration. The stereo instance above provides the same level of flexibility with support for mono accessibility. Just be aware of the configuration flexibility. 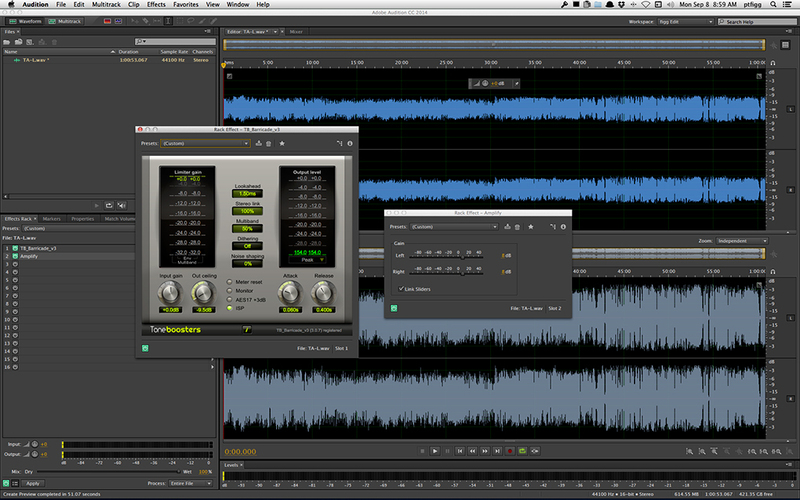 The lower image displays a Logic Pro X stereo I/O instance as it would appear when inserted on any track. Notice how I am using the same combination of interface channels (3 + 4) to output the signal to external components, and to route the processed audio back into the DAW. Let’s say you are the proud owner of the very affordable and recommended dbx 266xs Dynamics Processor. You would like to use it to pre-process a discrete channel Skype session in realtime. This dbx Compressor, Limiter, and Gate can function as a dual mono processor. With routing properly configured, you can insert mono instances of the hardware processor on discrete tracks in your DAW session. Simply customize settings for each dbx channel and fire away. Over the years I’ve accumulated various analog audio processors by Telos, dbx, and Aphex. In the displayed diagram I disclose part of my current configuration with a few active components. • I use a Mackie Onyx 1220i FW Mixer in combination with a Motu Audio Express USB/FW Interface. The Mackie controls a POTS line mix-minus using a Telos Digital Hybrid. The mixer also controls signal routing scenarios and recording on a Marantz CF Recorder. I use the mixer’s Control Room outputs to feed the inputs of a power amplifier to drive my JBL near-field monitors. • The Motu’s Main Outputs are patched to the mixer. This audio is available on the Control Room outputs. 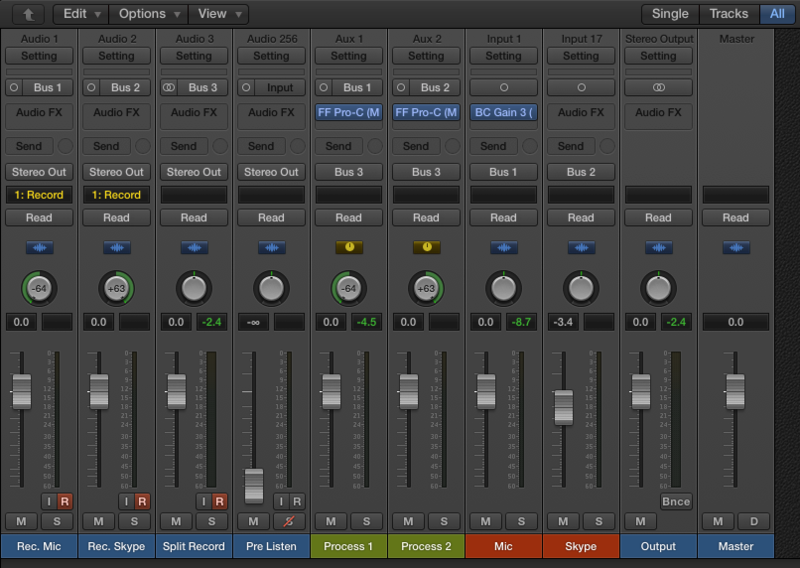 I can easily switch back and forth between the mixer and the interface, designating one or the other as the default I/O. • The dbx160a is a single channel (mono) compressor. It is connected to the Mackie’s channel 2 insert. I can use this device as a serial processor on mixer channel 2. I can also insert it on the channel that returns a telco caller’s POTS audio back to the mixer. In this scenario I can easily bypass it’s use on an insert and instead connect it in-line. • All system connections are made with balanced XLR and TRS cables. Not pictured: Aphex Expressor (mono) Compressor, Aphex 622 Expander/Gate, and Aphex two channel Parametric EQ. The two (pictured) devices that I am currently using for external audio processing are by Aphex: 320a Compellor, and the 720 Dominator II. The 320a Compellor is widely used in radio broadcast facilities. This device can be configured to function as a Leveler, Compressor, or a mixture of both. A Process Balance setting controls the Leveling and Compression weighting. It supports stereo and dual mono processing. The current “D” version supports AES/EBU Digital I/O. The Dominator II is a 3-band Peak Limiter with adjustable crossovers and zero overshoot. This device is also widely used in broadcast facilities and for live performances. 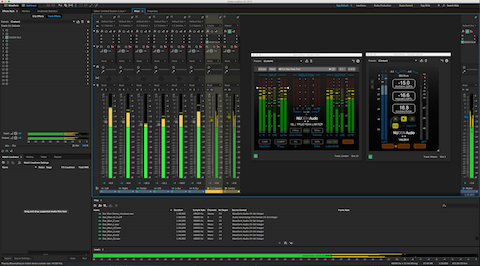 The current 722 version features enhanced broadcast processing support, including Pre-Emphasis and De-Emphasis options. With the Motu interface designated as the default I/0, it’s 3+4 Line Outputs route audio via insert from a Pro Tools audio track to the Compellor’s inputs. The Compellor’s outputs feed the Dominator II’s inputs. It’s outputs feed the Motu’s Line Inputs, routing the processed audio back to the DAW track where the hardware insert was originally instantiated. A Skype session would be an obvious use option. In this case I would implement discrete mono hardware processing using two separate insert instances. In fact I can use this configuration when recording any audio source, or as a realtime processing option for output, playback, and streaming. As far as playback, the Motu interface supports a Mix 1 Return option. 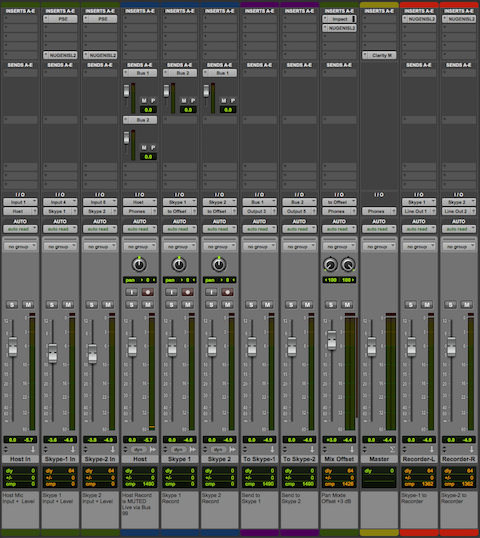 In essence I can assign my system’s output into Pro Tools. With Input Monitoring activated, I can route the signal through the external processors and monitor the wet audio. This is a handy feature during playback of poorly produced programs. Unfortunately Adobe Audition does not support hardware inserts. However there are various ways to integrate your external components in a multitrack session. For example you can assign a track’s output (or outputs) to an available interface output that feeds an external component’s input (or inputs). The processed audio is then routed to available interface inputs. 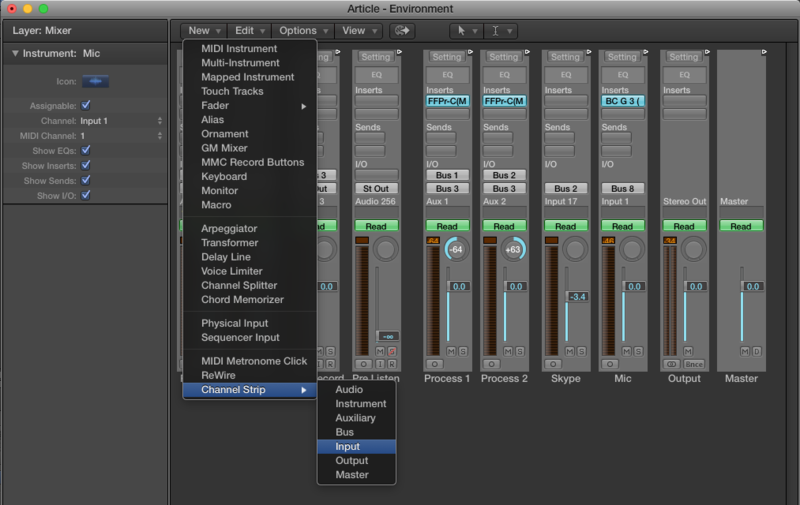 By defining this active interface input as a track input, you essentially route processed audio back into the session. This signal routing option will work in any DAW. Be aware you run the risk of initiating feedback loops!. To avoid this please make sure the software routing utility for the particular interface is properly configured. It is easy to integrate your analog gear in your software DAW. Use case scenarios are endless. Of course support and effectiveness will vary across all components and applications. I will say it’s a pretty cool feature, especially when software versions of coveted analog devices simply do not exist. Adobe Audition and Logic Pro X include Pan Mode preference options that determine track output gain for center panned mono clips included in stereo sessions. These options are often the source of confusion when working with a combination of mono and stereo clips, especially when clips are pre-Loudness Normalized prior to importing. 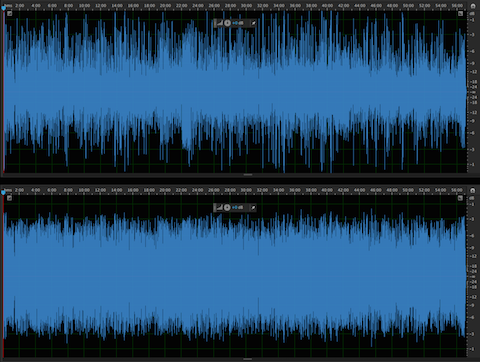 In Audition, the Left/Right Cut (Logarithmic) option retains center panned mono clip gain. The -3.0 dB Center option, which by the way is customizable – will attenuate center panned mono clip gain by the specified dB value. For example if you were targeting -16.0 LUFS in a stereo session using a combination of pre-Loudness Normalized clips, and all channel faders were set to unity – the imported mono clips need to be -19.0 LUFS (Integrated). The stereo clips need to be -16.0 LUFS (Integrated). The Left/Right Cut Pan Mode option will not alter the gain of the center panned mono clips. This would result in a -16.0 LUFS stereo mixdown. Conversely the -3.0 dB Center Pan Mode option will apply a -3 dB gain offset (it will subtract 3 dB of gain) to center panned mono clips resulting in a -19.0 LUFS stereo mixdown. In most cases this -3 LU discrepancy is not the desired target for a stereo mixdown. Note 1 LU == 1 dB. As stated Logic Pro X provides a similar level of Pan Mode flexibility. I’ve also tested Reaper, and it’s options are equally flexible. 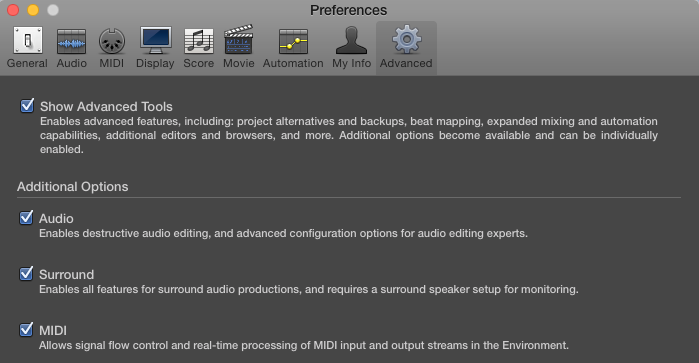 Pro Tools Pan Mode support (they call it Pan Depth) is somewhat restricted. The preference is limited to Center Pan Mode, with selectable dB compensation options (-2.5 dB, -3.0 dB, -4.5 dB, and -6.0 dB). There are several ways to reconstitute the loss of gain that occurs in Pro Tools when working with center panned mono clips in stereo sessions. One option would be to duplicate a mono clip and place each instance of it on hard-panned discrete mono tracks (L+R respectively). Routing the mono tracks to a stereo output will reconstitute the loss of gain. A second and much more efficient method is to route all individual instances of mono session clips to a stereo Auxiliary Input, and use it to apply the necessary compensating gain offset before the signal reaches the stereo Master Output. The gain offset can be applied using the Aux Input channel fader or by using an inserted gain trim plugin. Stereo clips included in the session can bypass this Aux and should be directly routed to the stereo Master Output. In essence stereo clips do not require compensation. Have a look at the attached Pro Tools session snapshot. In order to clearly display the signal path relative to it’s gain, I purposely implemented Pre-Fader Metering. Notice how the mono spoken word clip included on track 1 is routed (by way of stereo Bus 1-2) to a stereo Auxiliary Input track (named to Stereo). Also notice how the stereo signal level displayed by the meters on the Stereo Auxiliary Input track is lower than the mono source that is feeding it. The level variation is clear due to Pre-Fader Metering. It is the direct result of the session’s Pan Depth setting that is subtracting -3dB of gain on this center panned mono track. Next, notice how the signal level on the Master Output has been reconstituted and is in fact equal to the original mono source. We’ve effectively added +3dB of gain to compensate for the attenuation of the original center panned mono clip. The +3dB gain compensation was applied to the signal on the Auxiliary Input track (via fader) before routing it’s output to the stereo Master Output. So it’s: Center Panned mono resulting in a -3dB gain attenuation —>> to a stereo Aux Input with +3dB of gain compensation —>> to stereo Master Output at unity. In case you are wondering – why not add +3dB of gain to the mono clip and bypass all the fluff? By doing so you would be altering the native inherent gain structure of the mono source clip, possibly resulting in clipping. My described workflow simply reconstitutes the attenuated gain after it occurs on center panned mono clips. It is all necessary due to Pro Tool’s Pan Depth methods and implementation. The vast majority of audio industry professionals use DAWS running on proficient computer systems to record audio directly to secondary hard disks. For some reason direct to disk recording is not widely endorsed in the Podcasting space. Many consultants (for various reasons) advise against this recording method. Instead, they recommend the use of inexpensive hand-held solid state Recorders. For instance I’ve heard a few people state “computers cause ground loops”, hence the widespread Portable Recorder recommendation. In my opinion that is a half-baked assertion. In fact, ANY electronic component in a signal chain (including your electrical system) is capable of producing inherent noise. Often the replacement of cheaply manufactured components (interfaces, mixers, processors, cables, etc.) will solve audible noise problems. The key is to isolate the source and correct or replace it. Portable Recorders are well suited for location interviews and video shoots. For in-studio sessions I feel direct to disk recording on a proficient system is much more flexible compared to the use of an external device. More so, the sole use of a Portable Recorder without a proper backup strategy is flat out risky. That being said I thought I would document a basic Skype Recording session that I implemented in Pro Tools using a multi-output Motu Audio Interface. The incoming audio will be recorded on a secondary hard disk installed (or interfaced) on the host system. The real time session audio will also be routed to an alternate Interface Output, feeding an external Recorder for backup purposes. 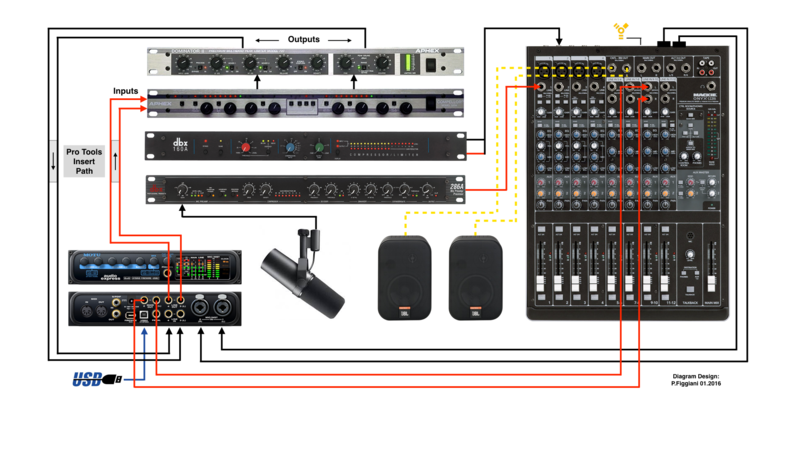 Note a multi-output Mixer can be used in place of an Audio Interface. As far as software you can use any modern DAW to replicate the described session. 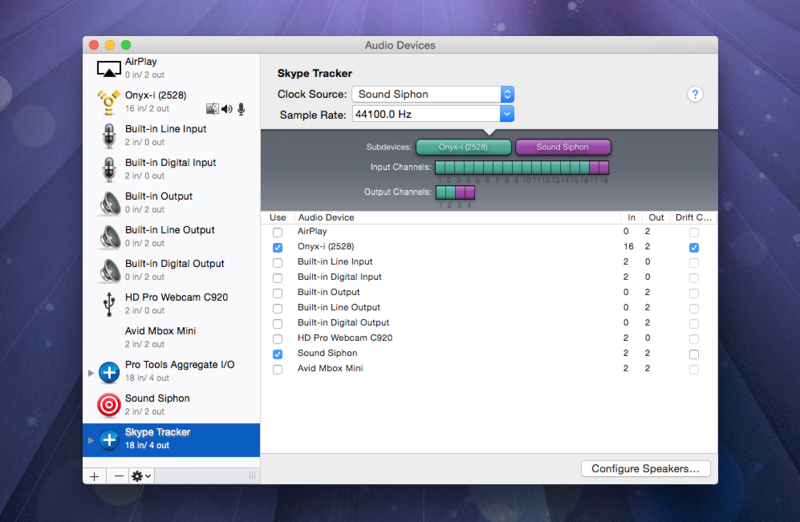 If you are using a Mac, Rogue Amoeba’s distinctive Audio Hijack application is also highly capable. 1-Record Studio Host and Skype Participant on discrete mono tracks in real time. 2-Combine the discrete recordings and create a split-stereo clip with independent dynamics processing applied to each channel, all in real time. 3-Use a Pre-Fader Send to independently control the level of the split-stereo discrete recording, and patch the real time signal to the Interface S/PDIF Output. This will feed the external Recorder’s S/PDIF Input. 4-Monitor the session through Headphones and play out through Desktop near-field Monitors. Please review the displayed Pro Tools session snapshot. • The Input for the mono Host track is the Interface connected mic. The Input for the mono Skype track is “Mix 1 Return.” This is an Interface supported feature, allowing the operator to route the computer’s Output (in this case Skype) to an available DAW Input. This configuration effectively creates a mix-minus with discrete, unprocessed recordings on individual mono tracks. • The mono recording tracks are routed to individual mono Aux Input tracks using Buses. The Aux Input tracks are hard-panned L+R and contain various inserted processing options, including a Gain Trim, Expander, and Compressor. The processing applied in this session is not intended to replace what would normally occur in post. The Compressors are there just to tame dynamics in the event either participant exceeds nominal input levels. The Expander is set up to apply mild attenuation when the host is not speaking. • The Aux Input tracks have their Outputs set to a common stereo Bus. • Finally a third standard stereo audio track (Rec-Sum) uses the stereo Bus Output(s) as it’s Inputs. By hard panning the channels L+R we are able to maintain discrete channel separation within any printed stereo clip. To record the discrete raw audio and the processed split-stereo audio in real time, we simply arm all session Audio tracks to record and fire away. The session can be monitored through Headphones and played out through near fields via the Main Output. The Motu Interface used for this session has a total of 8 Outputs, including a stereo S/PDIF option. I implemented Pre-Fader Send on the session’s Rec-Sum channel with it’s Output set to S/PDIF. This will route the track’s split-stereo audio to the S/PDIF stereo Input of an external Marantz CF Recorder. With the Send designated as Pre-Fader, it’s level control will be independent of the parent (Rec-Sum) channel fader, thus allowing discrete control of the real time signal being fed to the Recorder. Note in the displayed Pro Tools session snapshot – the floating fader positioned to the left of the mixer is a user friendly and easily accessible copy of the much smaller Send fader displayed in the parent (Rec-Sum) track. In summary, we can successfully initialize and capture 4 recordings in a single pass: the raw Host audio, the raw Skype participant audio, a split-stereo processed version of the Skype session, and a split-stereo copy of the processed Skype session stored on the Recorder. The image below displays the completed session with the split-stereo clip playing through the Main Outputs. My general recommendation:when it is feasible, use direct to disk and Portable recording options in unison on a proficient system to capture in-studio multitrack and single participant Podcast sessions. In a professional workflow Dither will be applied to audio clips (or mixes) when reducing word length. This process will mitigate errors that occur due to the subtraction of digital audio bits. I thought I’d cover the basics. Digital Audio incorporates individual samples consisting of bits created by the process of Quantization. This is essentially the conversion of a continuous, linear range of values present in analog audio into a fixed range of discrete values. Bit Depth (a.k.a. Word Length or Resolution) represents the number of bits stored in a sample’s measure of amplitude. It indicates the extent of inherent vertical precision. Higher bit depths (or bits per sample) encompass improved vertical dynamic resolution resulting in an extended Dynamic Range. 1 bit = 6dB of Dynamic Range. Theoretically 16bit audio has a quantified Dynamic Range of 96 dB. 24 bit audio has a quantified Dynamic Range of 144 dB. However, in order to accurately assess Dynamic Range we must also recognize the amplitude of the highest spectral component of the inherent noise floor. Specifically, where it resides relative to the maximum Peak value that a system is capable of reproducing. Dynamic Range is the measurement of this ratio or range. Signal to Noise Ratio (SNR) is the quantified range between the nominal average signal level and the average level of the noise floor. Audio with an extended Dynamic Range will exhibit a higher SNR compared to audio with a reduced Dynamic Range. In essence 24 bit audio will allow you to work with additional headroom without any increase in noise compared to 16 bit audio. Truncation is the removal of bits with no compensating replacement. The repositioning of samples after converting to a lower resolution creates Quantization Errors resulting in audible artifacts and distortion. Dither is technology that adds minimal perceived noise to audio before word length reduction. This noise will mitigate (mask/remove) the audibility of distortion caused by Quantization Errors. The process preserves fidelity and Dynamic Range of audio throughout bit-depth conversion and/or bit-depth reduction exporting. There is a trade off: you are replacing bad noise with alternative “good” noise that is smoother, less audible, and much more consistent. Noise Shaping is a supplemental option that pushes noise into frequency ranges that are less audible to humans, thus allowing greater Dither with reduced perceptual noise. 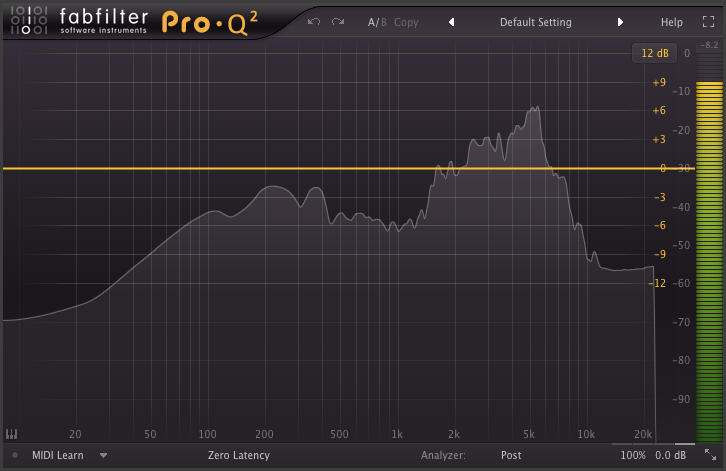 (Take a look at the Noise Shaped frequency response curve in the attached image. There is a clear visual indication of increased gain at higher frequencies). So what does this all mean for the typical Podcast Producer? 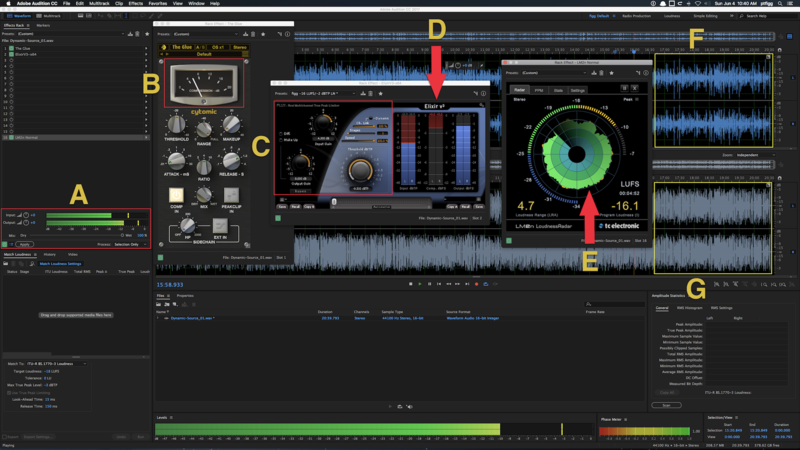 Is Dither just another obscure aspect of professional Audio Mastering and/or Post Production that can be safely ignored? If you are recording spoken word using properly configured gear in a reasonably quiet and optimized environment – there is no discernible advantage recording 24-bit audio in preparation for 16-bit encoding and delivery. In my opinion 16-bit audio from acquisition to distribution will be more than adequate. If you elect to record 24 bit audio, and you are not properly implementing word length reduction to 16 bit, you are essentially nulling the advantages of the original higher resolution audio. In essence fidelity degradation (artifacts/distortion) will occur due to the absence of efficient error masking. This is not my opinion – it is a fact. Remember, I’m specifically referring to spoken word audio slated for Podcast distribution. If you are tracking music, well then by all means make full use of the advantages of higher resolution audio recording. Most DAWS include Dither options. In some cases it’s by way of a plugin. You may also notice Dither options included in application Preferences or Export dialogs. Hopefully after reading this article you will understand what Dither is, it’s purpose, and whether you should consider implementing it. Please note: Dither must be applied at the very last stage of any processing chain. I’d like to share my observations and views on the recently published AES Technical Document AES TD1004.1.15-10 that specifics best practices for Loudness of Audio Streaming and Network File Playback. I support the purpose of this document, and I understand the stated recommendations will most likely evolve. However in my view the guidelines have the potential to create a fair amount of confusion for producers of spoken word content, mainly Podcast producers. I’m specifically referring to the suggested 4 LU range (-16.0 to -20.0 LUFS) of acceptable Integrated Loudness Targets and the solutions for proper targeting. Indeed compliance within this range will moderately curtail perceptual loudness disparities across a wide range of programs. However the leniency of this range is what concerns me. I am all for what I refer to as reasonable deviation or “wiggle room” in regard to Integrated Loudness Target flexibility for Podcasts. 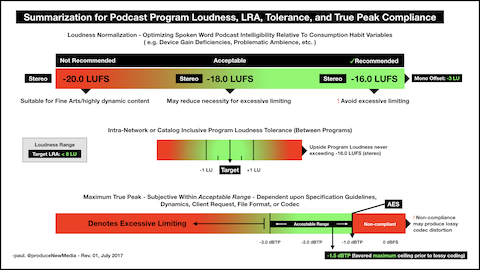 However IMHO a -20 LUFS spoken word Podcast approaches the broadcast Loudness Targets that I feel are inadequate for this particular platform. A comparable audio segment with wide dynamics will complicate matters further. And there is no mention of the perceptual disparities between Mono and Stereo files Loudness Normalized to the same Integrated Loudness Target. For the record I don’t support mono file distribution. However this file format is prevalent in the space. I feel the document’s perspective is somewhat slanted towards platform dependent music streaming and preservation of musical dynamics. In this category, broad guidelines are for the most part acceptable. This is due to the wide range of production techniques and delivery methods used on a per musical genre basis. Conversely spoken word driven audio is not nearly as artistically diverse. Considering how and where most Podcasts are consumed, intelligibility is imperative. In my view they require much more stringent guidelines. It’s important to note streaming services and radio stations have the capability to implement global Loudness Normalization. This frees content creators from any compliance responsibilities. All submitted media will be adjusted accordingly (turned up or turned down) in order to meet the intended distribution Target(s). This will result in consistency across the noted platform. Unfortunately this is not the case in the now ubiquitous Podcasting space. At the time of this writing I am not aware of a single Podcast Network that (A) implements global Loudness Normalization … and/or … (B) specifies a requirement for Integrated Loudness and Maximum True Peak Targets for submitted media. Currently Podcast Loudness compliance Targets are resolved by each individual producer. This is the root cause of wide perceptual loudness disparities across all programs in the space. In my view suggesting a diverse range of acceptable Targets especially for spoken word may further impede any attempts to establish consistency and standardization. The PLR correlates with headroom and dynamic range. It is the difference between the average Loudness and maximum amplitude. For example a piece of audio Loudness Normalized to -16.0 LUFS with a Maximum True Peak of -1 dBTP reveals a PLR of 15. As the Integrated Loudness Target is lowered, the PLR increases indicating additional headroom and wider dynamics. In essence low Integrated Loudness Targets will help preserve dynamic range and natural fidelity. This approach is great for music production and streaming, and I support it. However in my view this may not be a viable solution for spoken word distribution, especially considering potential device gain deficiencies and ubiquitous consumption habits carried out in problematic environments. In fact in this particular scenario a moderately reduced dynamic range will improve spoken word intelligibility. If a piece of audio is measured in it’s entirety and the Integrated Loudness is higher than the intended Target, a subtractive gain offset normalizes the audio. For example if the audio checks in at -18.0 LUFS and you are targeting -20.0 LUFS, we simply subtract 2 dB of gain to meet compliance. Conversely when the measured Integrated Loudness is lower than the intended Target, Loudness Normalization is much more complex. For example if the audio checks in at -20.0 LUFS, and the Integrated Loudness Target is -16.0 LUFS, a significant amount of gain must be added. In doing so the additional gain may very well cause overshoots, not only above the Maximum True Peak Target, but well above 0dBFS. Inevitably clipping will occur. From my perspective this would clearly indicate the audio needs to be remixed or remastered prior to Loudness Normalization. Under these circumstances I would be inclined to reestablish headroom by applying dynamic range compression. This approach will certainly curtail the need for aggressive limiting. As stated the reduced dynamic range may also improve spoken word intelligibility. I’m certainly not suggesting aggressive hyper-compression. The amount of dynamic range reduction is of course subjective. Let me also stress this technique may not be suitable for certain types of music. With these points in mind, please review/demo the following spoken word audio segment. In my opinion the audio in it’s current state is not optimized for Podcast distribution. It’s simply too low in terms of perceptual loudness and too dynamic for effective Loudness Normalization, especially if targeting -16.0 LUFS. Due to these attributes suggestion 1 above is clearly not an option. In fact neither is option 2. There is simply no available headroom to effectively add gain without driving the level well above full scale. Peak limiting is unavoidable. I feel the document suggestions for the segment above are simply not viable, especially in my world where I will continue to recommend -16.0 LUFS as the recommended Target for spoken word Podcasts. Targeting -18.0 LUFS as opposed to -16.0 LUFS is certainly an option. It’s clear peak limiting will still be necessary. 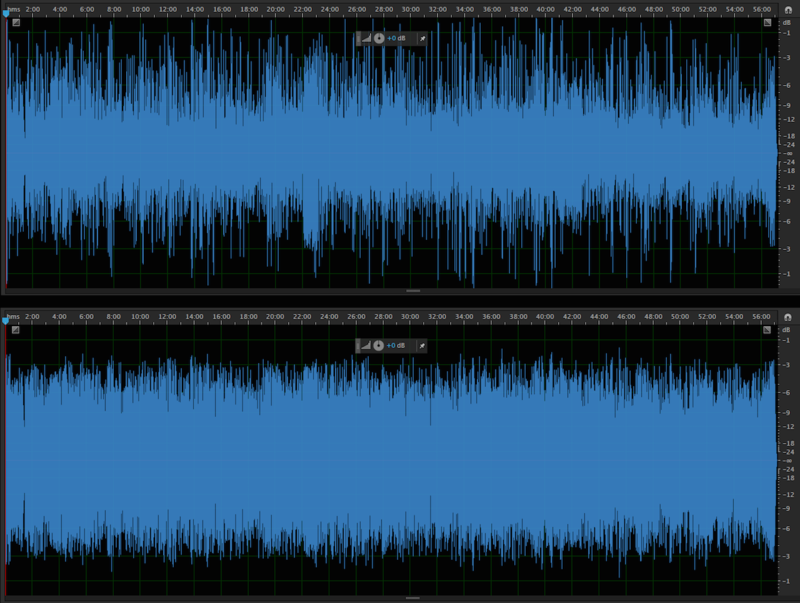 Below is the same audio segment with dynamic range compression applied before Loudness Normalization to -16.0 LUFS. Notice there is no indication of aggressive limiting, even with a Maximum True Peak of -1.7 dBTP. This modification is adequate. However the general concept continues to suggest the acceptance of flexible Targets for spoken word. This may impede perceptual consistency across multiple programs within a given network. The flexible best practices suggested in the AES document are 100% valid for music producers and diverse distribution platforms. However in my opinion this level of flexibility may not be well suited for spoken word audio processing and distribution. I’m willing to support the curtailment of heavy peak limiting when attempting to normalize spoken word audio (especially to -16.0 LUFS) by slightly reducing the intended Integrated Loudness Target … but not by much. I will only consider doing so if and when my personal optimization methods prior to normalization yield unsatisfactory results. My recommendation for Podcast producers would be to continue to target -16.0 LUFS for stereo files and -19.0 LUFS for mono files. If heavy limiting occurs, consider remixing or remastering with reduced dynamics. If optimization is unsuccessful, consider lowering the intended Integrated Loudness Target by no more than 2 LU. A True Peak Maximum of <= -1.0 dBTP is fine. I will continue to suggest -1.5 dBTP for lossless files prior to lossy encoding. This will help ensure compliance in encoded lossy files. What’s crucial here is a full understanding of how lossy, low bit rate coders will overshoot peaks. This is relevant due to the ubiquitous (and not necessarily recommended) use of 64kbps for mono Podcast audio files. Let me finish by stating the observations and recommendations expressed in this article reflect my own personal subjective opinions based on 11 years of experience working with spoken word audio distributed on the Internet and Mobile platforms. Please fell free to draw your own conclusions and implement the techniques that work best for you. I thought I’d clear up a few misconceptions regarding the Multiband Compressor bundled in Adobe Audition. Also, I’d like to discuss the infamous “Broadcast” preset that I feel is being recommended without proper guidance. This is an aggressive preset that applies excessive compression and heavy limiting resulting in processed audio that is often fatiguing to the listener. The tool itself is “Powered by iZotope.” They are a well respected audio plugin and application development firm. Personally I think it’s great that Adobe decided to bundle this processor in Audition. However, it is far from a novice targeted tool. In fact it’s pretty robust. What’s interesting is it’s referred to as a “Multiband Compressor.” This is slightly misleading, considering the processor includes a Peak Limiter stage along with it’s advertised Multiband Compressor. I think Dynamics Processor would be a more suitable name. Basically the multi-band Compressor includes 3 adjustable crossovers, resulting in 4 independent Frequency Bands. Each Band includes a discrete Compressor with Threshold, Gain Compensation, Ratio, Attack, and Release settings. Bands can be soloed or bypassed. There is global Peak Limiter module located to the right of the Compressor settings. This module may be activated or bypassed. Without a clear understanding of the supplied settings for the Limiter, you run the risk of generating excessive loudness when processing audio. I’m referring to a substantial increase in perceived loudness. The Threshold is the limiting trigger. When the input signal surpasses it, limiting is activated. The Margin is what defines the Peak Ceiling. As you decrease the Threshold, the signal is driven up to and against the Margin resulting in an increase in average loudness. This also results in dynamic range reduction. Activating the “Brickwall Limiter” feature in the supplemental Options module will ensure accurate Margin compliance. In essence you will be implementing Hard Limiting. Deactivating this option may result in “overs” and/or peaks that exceed the specified Margin. The bundled Broadcast preset defaults the Limiter Threshold setting to -10.0 dB with a Margin of -0.1 dBFS. Any alternative Threshold settings are of course subjective. I’m suggesting that it may be a good idea to ease up on this default Threshold setting. This will result in less aggressive limiting and a reduction of average levels. I’m also suggesting that the default Margin setting of -0.1 is not recommended in this context. I would set this to -1.0 dBFS or lower (-1.5 dBFS, or even -2.0 dBFS). Please note this is not a True Peak Limiter. Your processed lossless audio file has the potential to loose headroom when and if it is converted to a lossy codec such as MP3. At this point I suggest no changes should be made to the Attack and Release settings. We cannot discount additional settings included in the Broadcast preset that are contributing to the aggressive processing. If you examine the Ratio settings for each independent compression module, 3:1 is the highest set Ratio. The predefined Ratios are fairly moderate and for starters require no adjustment. However, notice the Threshold settings for each compression module as well as the Gain Compensation setting in Module (band) 4 (+3 dB). First, the low Threshold settings result in fairly aggressive compression per band. Also, the band 4 gain compensation is generating a further increase in average level for that particular band. Again the settings and any potential adjustments are subjective. My recommendation would be to experiment with the Threshold settings. Specifically, cut back by reducing all Thresholds while maintaining their relative relationship. Do this by activating the “Link Band Controls” setting located in the supplemental Limiter Options. View the red Gain Reduction meters included in each module. Monitor the amount of attenuation that occurs with the default Threshold settings. Compare initial readings with the gain reduction that occurs after you make your adjustments. Your goal is to ease up on the gain reduction. This will result in less aggressive compression. Remember to use your ears! An area of misinformation for this processor is the purpose of the Output Gain adjustment, located at the far upper right of the interface. Please note this setting does not define the Peak Ceiling! Remember – it is the Margin setting in the Limiter module that defines your Ceiling. The Output Gain simply adds or cuts global output level after compression. Think of if it as Global Gain compensation. To prove my point, I dug out a short video demo that I created sometime last year for a community member. With the Broadcast preset selected, and the Output Gain set to -1.5 dBFS – the actual output Peak Amplitude surpasses -1.5 dBFS, even with the Brickwall option turned ON. This reading is displayed numerically above the Output Gain meter(s) in real time. In the second pass of the test I set the Output Gain to 0 dBFS. I then set the Limiter Margin to -1.5 dBFS. As the audio plays through you will notice the output is limited to and never surpasses -1.5 dBTP. 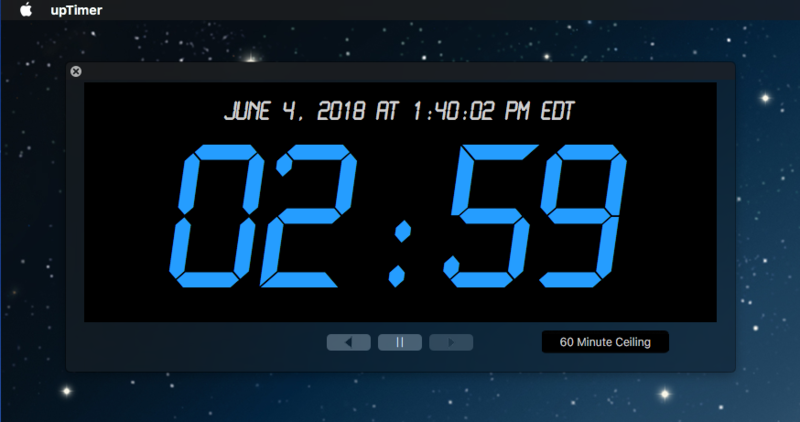 Just keep your eye on the numerical, realtime display. I purposely omitted any specific references to Attack and Release settings. They are the source for a future discussion. Here’s an alternative use recommendation for this Adobe Multiband Compressor: DeEssing. Use the Spectrum Analyzer to determine the frequency range where excessive sibilant energy occurs. Set two crossovers to encapsulate this range. Bypass the remaining associated compression modules. Tweak the remaining active band compression settings thus allowing the compressor to attenuate the problematic sibilant energy. If you find the supplied Spectrum Analyzer difficult to read, consider using a third party option with higher resolution to perform your analysis. Please note – in order to get the most out of this tool, you really need to learn and understand the basics of dynamics compression and how each setting will affect the source audio. More importantly, when someone simply suggests the use of a preset, take it with a grain of salt. More than likely this person lacks a full understanding of the tool, and may not be capable of providing clear instructional guidance for all functions. It’s a bad mix – especially when charging novices big bucks for training. By the way, nothing wrong with being a novice. The point is paid consultants have an obligation to provide expert assistance. Boiler plate suggestions serve no purpose. The dbx brand has been a favorite of mine since the late 1970’s. My first piece of dbx kit was a stand-alone noise reduction unit that I coupled with an old Teac Reel to Reel Tape Deck. Through the years I’ve owned various EQ’s and Dynamics processors, including the highly regarded 160A Compressor. I purchased mine in 2006. In January 2011 I was skimming through eBay listings looking for a dbx 286A Microphone Preamp Processor. At the time I had heard the original 286 model was co-designed by Bob Orban, and both models were widely used in Radio Broadcast facilities. I found it interesting that Radio Engineers would use a piece of gear that was not only cheap in terms of cost – but unconventional in terms of controls. One piece was available on eBay, supposedly used for 4 hours at a party in Hollywood Hills California, and then boxed for resale. The seller had a positive reputation, so I grabbed it for $115. Upon arrival it’s condition was as described, and it’s been in my rack ever since. The 286/286A has evolved into the 286s, quite frankly an outright steal priced at $199. Due to it’s straight forward approach and affordable price, the Podcasting community has embraced it and often classifies it as “drool-worthy.” Pretty amusing. In this article I am going to focus on the attributes of the Compressor stage and the De-Esser. I will demystify the DeEsser and discuss the importance of the Output (Gain) Compensation setting. I mentioned the processor is unconventional. For example the Compressor’s Drive and Density settings essentially replace the Threshold, Ratio, Attack, and Release controls present on most Compressors. The De-Esser requires a user defined High-Pass Frequency designation and Threshold setting to reduce excessive sibilance. Setup can be time consuming due to the lack of any visual representation of problematic energy in need of attenuation. The Drive control on the 286s determines the amount of gain reduction (compression) applied to the incoming signal. Higher settings will increase the input signal level resulting in more aggressive compression (and noise). When using a compressor to process spoken word, improper Release settings can result in choppiness, often referred to as pumping. The key is to have the gain reduction occurrences smoothly transition between instances of audible sound and natural pauses (silence). The 286s uses a variable program dependent Release. In the event you feel (and hear) the necessity to speed up or slow down the program dependent Release – the Density control will come in handy. Note the Density scale on the 286s is again somewhat unconventional. On a typical dynamics processor – setting the Release full counter-clockwise would result in a very fast Release. As the setting is adjusted clockwise, the Release duration is extended. The scale usually transitions from milliseconds to full seconds. On the 286s, think of Density as a linear speed controller, where “1” (counter-clockwise) is slow and “10” (full clockwise) is fast. For normal speech I recommend experimenting with the Density set between 3 and 5. If you check around you will notice a wide range of references regarding the frequency range where sibilance generally occurs. In reality there are many variables. Each instance of sibilance will need to be accurately identified and addressed accordingly. The 286s De-Esser uses a variable high-pass filter. This instructs the processor where to initiate the attenuation of problematic energy. This Frequency control has a range of 800Hz-10kHz. The user manual states ” … settings between 4-8kHz will yield the best results for vocal processing.” This is good starting point. However proper setup requires time consuming arbitrary tweaking that may result in a low level of accuracy. A visual representation of the frequency range of the excessive sibilant energy will solve this problem. Once you identify the frequencies and/or range where most of the energy is present, setting the Frequency on the 286s will be demystified. The De-Esser’s Threshold setting controls the amount of attenuation (sensitivity) and will remain constant as the input level changes. Notice the excessive energy in the 2-6kHz range (Frequency Range is represented on the X axis). For this particular segment of audio I would initially set the Frequency control on the 286s to 5kHz. Next I would adjust the Threshold until the sibilant energy is attenuated. I would then sweep the Frequency setting within the visual range of the sibilant energy and fine tune both settings until I achieve the most pleasing results. The key is not to over do it. Heavy attenuation will suppress vital energy and remove any hint of natural presence and sparkle. To perform this analysis excersize – set the Threshold setting on the 286s to OFF. Pass the output of the processor to your DAW of choice and perform a real time spectral analysis of your voice using a software plugin the includes a Spectrum Analyzer. You can use any supported EQ plugin with it’s controls bypassed. You can also use something like the free (AU/VST) Span plugin by Voxengo (note that Span is CPU intensive). Gain Compensation is an integral element of Audio Compression. It’s intent is to offset the gain reduction that occurs when audio is compressed. It is often referred to as Make-up Gain. When this gain offset is applied to compressed audio, the perceived, average level of the audio is increased. Excessive Make-up Gain can sometimes elevate noise that may have been previously inaudible at lower average levels. Earlier I discussed how an elevated Drive control setting on the 286s will increase the input signal of low level source audio. In doing so you may initiate a suitable amount of compression. However you also run the risk of a noticeable increase in noise. In this particular scenario, try setting the Output Gain on the 286s to a negative value to offset the gain (and noise) that may have been introduced by the Drive setting. I think it’s important to first learn the basics of Audio Compression from a conventional perspective. In doing so you will find it easier to get the most out of the unconventional controls on the dbx 286s, especially Drive and Density. And let’s not forget that De-Essing is really nothing more than frequency band compression that will attenuate problematic energy. Establishing a visual reference to the energy will simplify the process of accurate correction. A waveform consists of both a Positive and Negative side, separated by a center (X) axis or “Baseline.” This Baseline represents Zero (∞) amplitude as displayed on the (Y) axis. The center portion of the waveform that is anchored to the Baseline may be referred to as the mean amplitude. DC Offset occurs when the mean amplitude of a waveform is off the center axis due to differing amounts of the signal shifting to the positive or negative side of the waveform. One common cause of this shift is when faulty electronics insert a DC current into the signal. This abnormality can be corrected in most file based editing applications and DAW’s. 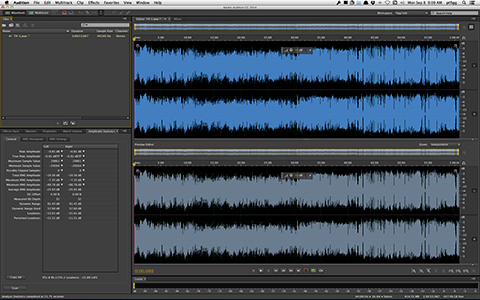 Left uncorrected, audio with DC Offset will exhibit compromised dynamic range and a loss of headroom. Unlike waveforms that indicate DC Offset, Asymmetric waveform’s mean amplitude will reside on the center axis. However the representations of positive and negative amplitude (energy) will be disproportionate. This can inhibit the amount of gain that can be safely applied to the audio. In fact, the elevated side of a waveform will tap the target ceiling before it’s counterpart resulting in possible distortion and the loss of headroom. High-pass filters, and aggressive low-end processing are common causes of asymmetric waveforms. Adding gain to asymmetric waveforms will further intensify the disproportionate placement of energy. Broadcast engineers closely monitor positive to negative energy distribution as their audio passes through various stages of processing and transmission. Proper symmetry aides in the ability to process a signal more effectively downstream. In essence uniform gain improves clarity and maximizes loudness. In spoken word – symmetry allows the voice to ride higher in the mix with a lower risk of distortion. Since many Podcast Producers will be adding gain to their mastered audio when loudness normalizing to targets, the benefits of symmetric waveforms are obvious. If an audio clip’s waveform(s) are asymmetric and the audio exhibits audible distortion and/or a loss of headroom, a Phase Rotator can be used to reestablish proper symmetry. Please note that asymmetric waveforms are not necessarily bad. In fact the human voice (most notably male) is often asymmetric by nature. If your audio is well recorded, properly processed, and pleasing to the ear … there’s really no need to attempt to correct any indication of asymmetry. However if you are noticing abnormal displacement of energy, it may be worth looking into. My suggestion would be to evaluate your workflow and determine possible causes. Listen carefully for any indication of distortion. Often a slight EQ tweak or a console setting modification is all that may be necessary to make noticeable (audible) improvements to your audio. If you are in the audio production business or involved in some sort of collaborative Podcast effort, moving large lossless audio files to and from various locations can be challenging. Slow internet speeds, Hotel WiFi, and server bottlenecks have the potential to cripple efficient file management and ultimately impede timely delivery. And let’s not forget how quickly drive space can diminish when storing WAV and/or AIFF files for archival purposes. From the perspective of a Spoken Word New Media Producer, there are two requirements for Intermediate files: Size Reduction and Retention of Fidelity. The benefits of file size reduction are obvious. File transfers originating from locations with less than ideal connectivity would be much more efficient, and the consumption of local or remote disk/server space would be minimized. The key here is to use a flexible lossy codec that will reduce file sizes AND hold up well throughout various stages of encoding and decoding. Consider the possible benefits of the following client/producer relationship: A client converts (encodes) lossless files to lossy and delivers the files to the producer via FTP, DropBox, etc. The Producer would then decode the files back to their original format in preparation for post production. When the work is completed, the distribution file is created and delivered (in most cases) as an MP3. Finally with a bit of ingenuity, the producer can determine what needs to be retained for archival purposes, and convert these files back to the intermediate format for long term storage. How about this scenario: Podcast Producer A is located in L.A.. Producer B is located in NYC. Producer B handles the audio post for a double-ender that will consist of 2 individual WAV files recorded locally at each location. Upon completion of a session, the person in L.A must send the NY based audio producer a copy of the recorded lossless audio. The weekly published program typically runs upwards of 60 minutes. Needless to say the lossless files will be huge. Let’s hope the sender is not in a Hotel room or at Starbucks. MPEG 1 Layer II (commonly referred to as MP2 with an .mp2 file extension) is in fact a lossy “perceptual” codec. What makes it so unique (by design) is the format’s ability to limit the introduction of artifacts throughout various stages of encoding and decoding. And get this – MP2’s check in at about 1/5th the size of a lossless source. For example a 30 minute (16 bit/44.1kHz) Stereo WAV file currently residing on my desktop is 323.5 megabytes. It’s MP2 counterpart is 58.7 megabytes. If you look into the file submission requirements over at PRX (The Public Radio Exchange) and NPR (see requirements), you will notice MP2 audio files are what they ask for. In fact during the early days of IT Conversations, founder and Executive Director Doug Kaye implemented the use of MP2 audio files as intermediates throughout the entire network based on recommendations by some of the most prominent engineers in the Public Radio space. We expected our show producers and content providers to convert their audio files to MP2 prior to submission to our servers using third party software applications. Eventually a proprietary piece of software (encoder/uploader) was developed and distributed to our affilates. The server side MP2’s were downloaded by our audio engineers, decoded to lossless, produced, and then sent back up to the network as MP2 in preparation for server side distribution encoding (MP3). From a personal perspective I was so impressed with the codec’s performance, I immediatly began to ask my clients to submit MP2 audio files to me, and I’ve never looked back. I have never experienced a noticeable degradation of audio quality when converting a client’s MP2 back to WAV in preparation for post. In my view it’s always a good idea to have unfettered access to all previously produced project files. Besides produced masters, let’s not forget the accumulation of individual project assets that were edited, saved, and mixed in post. On average my project folders that include audio assets for a 30 minute program may consume upwards of 3 Gigabytes of storage space. Needless to say an efficient method of storage is imperative. If you are concerned about the possibility of audio quality degradation due to compression artifacts, well that’s understandable. In certain instances accessability to raw, uncompressed audio will be more suitable. However I am convinced that you will be impressed with how well MP2 audio files hold up throughout various workflows. Convert a stereo WAV file to stereo MP2 (256 kbps). Compare the file sizes. Listen to the MP2 and assess fidelity retention. Then convert the stereo MP2 directly to stereo MP3 (128 kbps). Listen for any indication of noticeable artifacts. My recommendation would be to first experiment with converting a few of your completed project assets to MP2 in preparation for storage. I’ve found that I rarely need to dig back into old work. I have on a few occasions, and the decoded MP2’s were perfectly fine. Note that I always save a copy of the produced lossless master. There are many audio applications that support MP2 encoding. Since I have limited exposure to Windows based software, the scope of my awareness is narrow. I do know that Adobe Audition supports the format. In the past I’ve heard that dBPowerAmp is a suitable option. On the Mac side, besides the cross platform Audition – there is a handy utility on the Mac App Store called Audio-Converter. It’s practically free, priced at $0.99. File encoding is also supported in FFmpeg either from the Command Line or through various third party front ends. Here’s a good place to download pre-compiled FFmpeg binaries. Many modern media applications support native playback of MP2 audio files, including iTunes and Quicktime. If you are in the business of moving around large Spoken Word audio files, or if you are struggling with disk space consumption issues, the use of MP2 audio files as intermediates is a worthy solution. 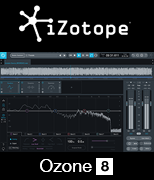 iZotope has released a newly designed version of Ozone, their flagship Mastering processor. Notice I didn’t refer to Ozone  as a plugin? Well I’m happy to report that Ozone  is now capable to run independent of a DAW as a stand-alone desktop processor. I’ve been a customer and supporter of iZotope since early 2005. If I remember correctly Ozone 3 was the first version that I had access to. In fact back in the early days of Podcasting, many producers purchased an Ozone license based on my endorsement. This was an interesting scenario all due to the fact that most of the people in the community who bought it – had no idea how to use it! And so a steady flow of user support inquiries began to trickle in. I decided the best way to bring users up to speed was to design Presets. I would distribute the underlying XML file and have the users move it to the proper location on their system’s. After doing so, the Preset would be accessible within Ozone’s Preset Manager. The complexity of the Presets varied. Some people wanted basic Band-Pass filters. Others requested the simulation of a broadcast chain that would result in a signature sound for their recorded voice. In fact I remember one particular instance where the user requested a Preset that would make him sound like an “AM Radio DJ”. So I went to work and I think I made him happy. As Ozone matured, it’s level of complexity increased resulting in somewhat sluggish performance (at least for me). 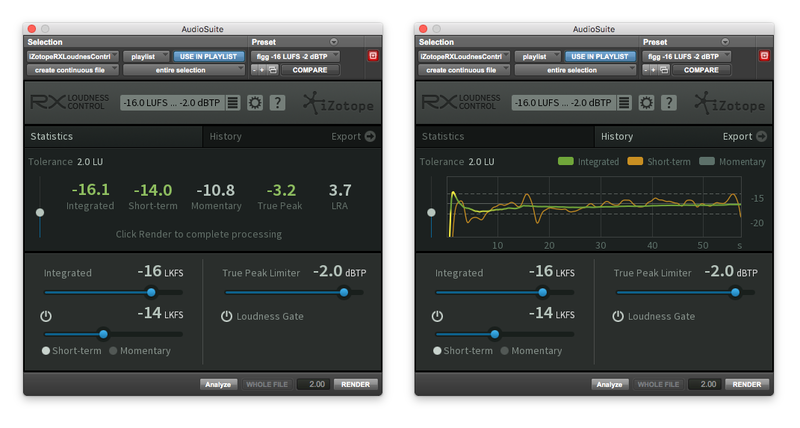 When iZotope released Alloy 2, I bought it – and found it to be much more responsive. And so I sort of moved away from Ozone, especially Ozone 5. My guess is if my system’s were a bit more robust, poor performance would be less of an issue. Note that my personal experience with Ozone was not necessarily the general concensus. Up to this latest release, the plugin was highly regarded with widespread use in the Mastering community. Over the past 24 hours I’ve been paying close attention to how Ozone users are reacting to this new version. Note that a few key features have been removed. The Reverb module is totally gone. Gating/Expansion has been removed from the Dynamics Module, and the Dithering options have been minimized. The good news is these particular features are not game changers for me based on how I use this tool. I will say the community reaction has been tepid. Some users are passing on the release due to the omissions that I’ve mentioned and others that I’m sure I’ve overlooked. For me personally – the $99 upgrade was a no-brainer. In my view the stand-alone functionality and the support for third party plugins makes up for what has been removed. In stand-alone mode you can import multiple files, save your work as projects, implement processing chains in a specific order, apply head/tail cuts/fades, and export your work. Ozone  will accept WAV, AIFF, or MP3 files. If you are exporting to lossless, you can convert Sample Rates and apply Dither. This all worked quite well on my 2010 MacPro. In fact the performance was quite good, with no signs of sluggish performance. I did notice some problematic issues with plugin wrappers not scaling properly. Also the Plugin Manager displayed duplicates of a few plugins. This did not hinder performance in any way. In fact all of my plugins functioned well. And so that’s my preliminary take. My guess is this new version of Ozone is well suited for advanced New Media Producers who have a basic understanding of how to process audio dynamics and apply EQ. Of course there’s much more to it, and I’m around to answer any questions that you might have. Peak Meters are exact – when they are used to display what they are designed to measure:Sample Peak Amplitude. They do not display an accurate representation of average, perceived loudness over time. They should only be used to monitor and ultimately prevent overload (clipping). It’s great that the people in Public Radio are finally addressing distribution Loudness consistency and compliance. My hope is their initiative will carry over into their podcast distribution models. In my view before any success is achieved, a full understanding of all spec. descriptors and targets would be essential. I’m referring to Program (Integrated) Loudness, Short Term Loudness, Momentary Loudness, Loudness Range, and True Peak. A Loudness Meter will display all delivery specification descriptors numerically and graphically. Meter descriptors will update in real time as audio passes through the meter. Short Term Loudness values are often displayed from a graphical perspective as designed by the developer. For example TC Electronic’s set of meters (with the exception of the LM1n) display Short Term Loudness on a circular graph referred to as Radar. 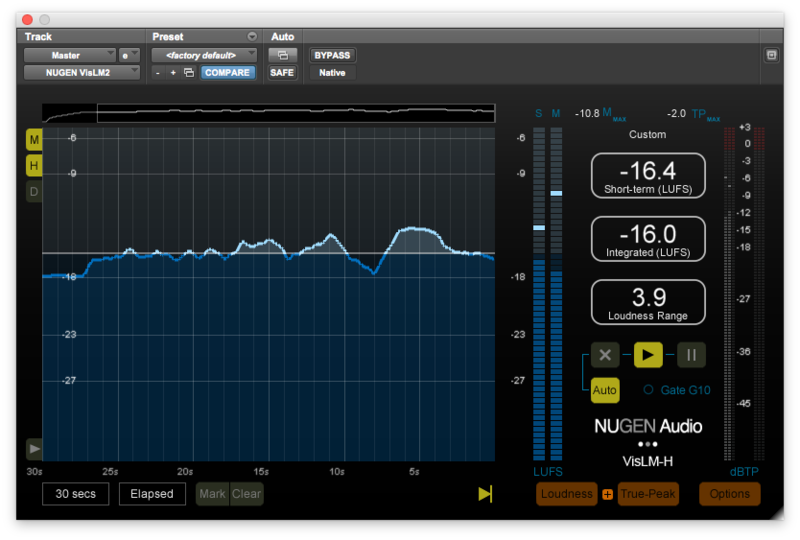 Nugen Audio’s VisLM meter displays Short Term Loudness on a grid based histogram. Both versions can be customized to suit your needs and work equally well. Loudness Meters also include True Peak Meters that display any occurrences of Intersample Peaks. All Loudness standardization guidelines specify a Program Loudness or “Integrated Loudness” target. This time scaled descriptor indicates the average, perceived loudness of an entire segment or program from start to finish. It is displayed on an Absolute scale in LUFS (Loudness Units relative to Full Scale), or LKFS (Loudness Units K Weighted relative to Full Scale). Both are basically the same. LUFS is utilized in the EBU R128 spec. and LKFS is utilized in the ATSC A/85 spec. What is important is that a Loudness Meter can display Program Loudness in either LUFS or LKFS. The Short Term Loudness (S) descriptor is measured within a time window of 3 seconds, and the Momentary Loudness (M) descriptor is measured within a time window of 400 ms. The Loudness Range (LRA) descriptor can be associated with dynamic range and/or loudness distribution. It is the difference between average soft and average loud parts of an audio segment or program. This useful indicator can help operators decide whether dynamic range compression is necessary. The specification Gate (G10) function temporarily pauses loudness measurements when the signal drops below a relative threshold, thus allowing only prominent foreground sound to be measured. The relative threshold is -10 LU below ungated LUFS. Momentary and Short Term measurements are not gated. There is also a -70 LUFS Absolute Gate that will force metering to ignore extreme low level noise. I mentioned that LUFS and LKFS are displayed on an Absolute scale. For example the EBU R128 Program Loudness target is -23.0 LUFS. 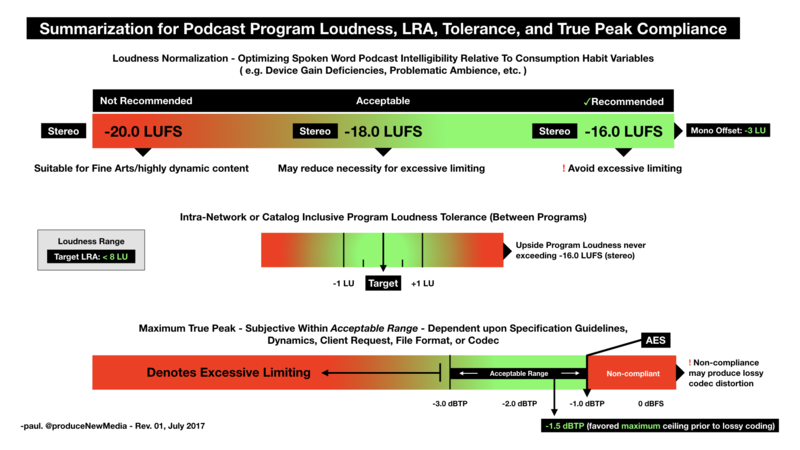 For Podcast/Internet/Mobile the Program Loudness target is -16.0 LUFS. There is also a Relative scale that displays LU’s, or Loudness Units. A Relative LU scale corresponds to an Absolute LUFS/LKFS scale, where 0 LU would equal the specified Absolute target. In practice, -23 LUFS in EBU R128 is equal to 0 LU. For Podcast/Mobile -16.0 LUFS would also be equal to 0 LU. Note that the operator would need to set the proper Program Loudness target in the Meter’s Preferences in order to conform. 1 LU is equal to 1 dB. So for example you may have measured two programs: Program A checks in at -20 LUFS. Program B checks in at -15 LUFS. In this case program B is +5 LU louder than Program A.
Loudness Meter plugins mainly support online (Real Time) measurement of an audio signal. 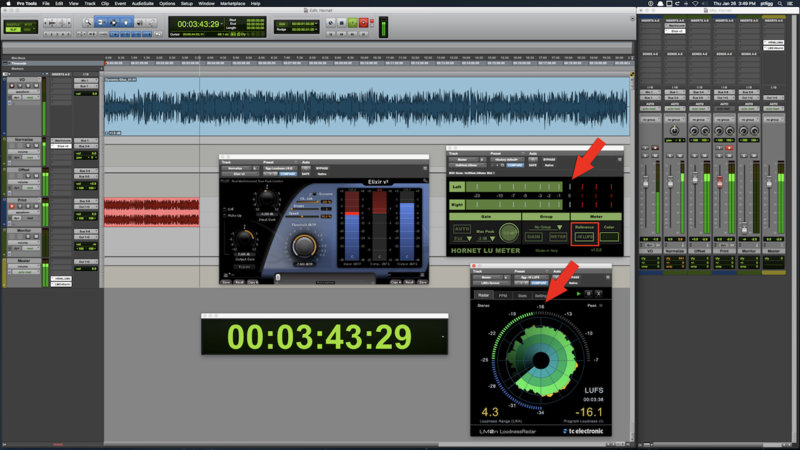 For an accurate measurement of Program Loudness of a clip or mixed segment the meter must be inserted in the DAW at the very end of a processing chain, preferably on the Master channel. If the inserts on the Master channel are post fader, any change in level using the Master Fader will result in a global gain offset to the entire mix. The meter would then (over time) display the altered Program Loudness. If your DAW’s Master channel has pre fader inserts, the Loudness Meter should still be inserted on the Master Channel. However the operator would first need to route the mix through a Bus and use the Bus channel fader to apply global gain offset. The mix would then be routed to the Master channel where the Loudness Meter is inserted. If your DAW totally lacks inserts on the Master channel, Buses would need to be used accordingly. Setup and routing would depend on whether the buses are pre or post fader. 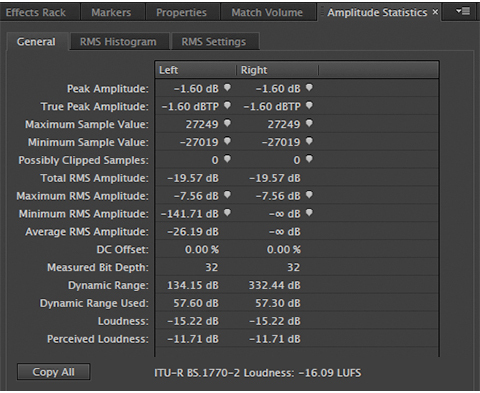 Some Loudness Meter plugins are capable of performing offline measurements in certain DAW’s on selected regions and/or clips. In Pro Tools this would be an Audio Suite process. You can also accomplish this in Logic Pro X by initiating and completing an offline bounce through a Loudness Meter.